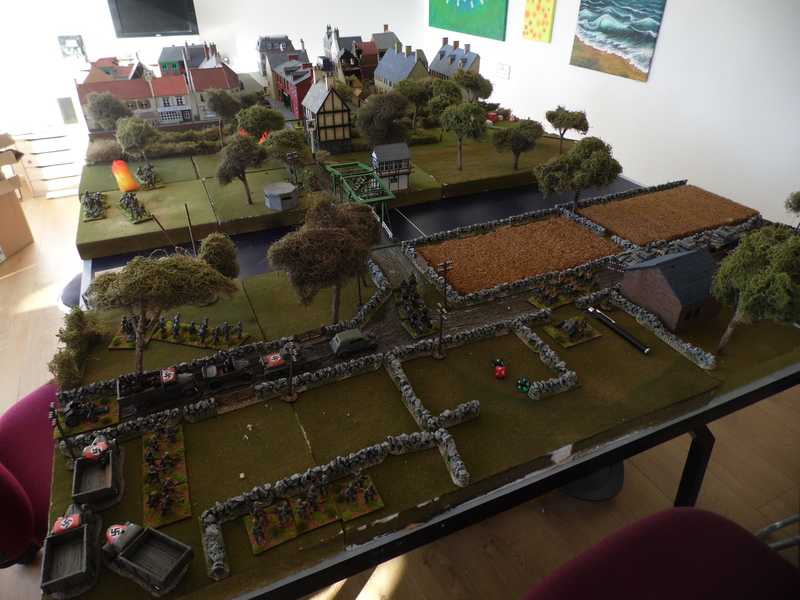 For our October game we decided to play an era I have not played for about 4 years and in a scale we have never played. 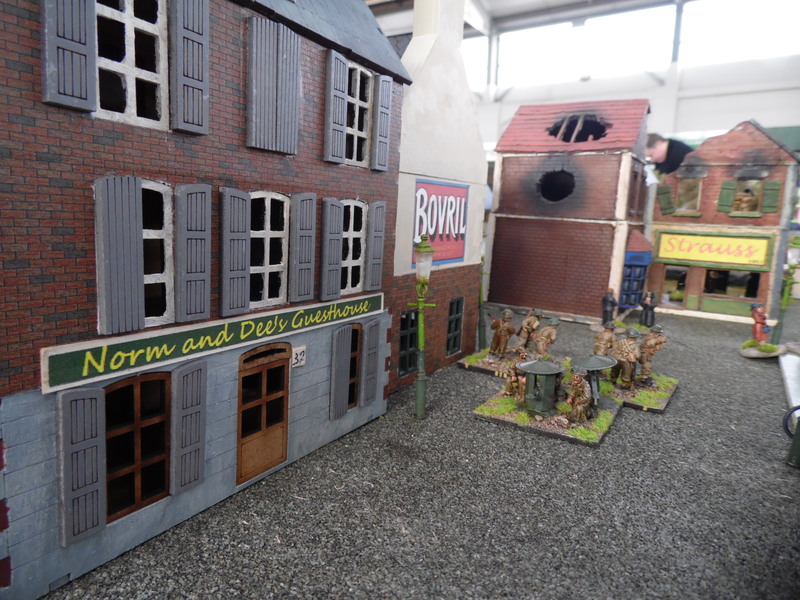 I have had a few items in my collection but they have sat at the back of the garage unpainted. 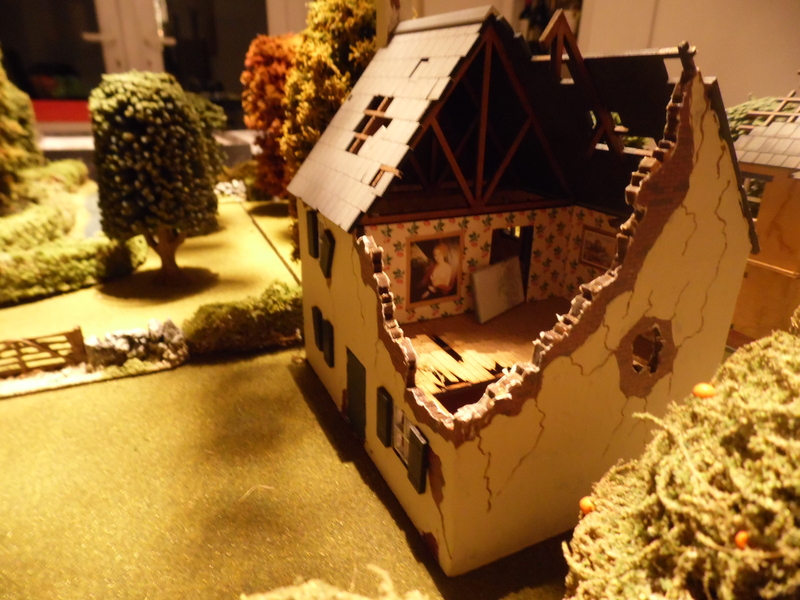 That meant that the last month has been full of painting and basing. 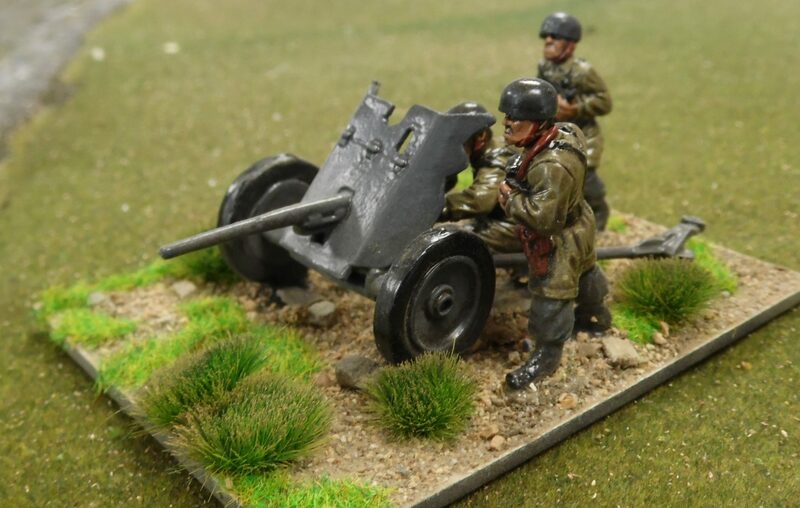 Luckily on the way I managed to find a few items on Ebay that fitted my requirements perfectly. 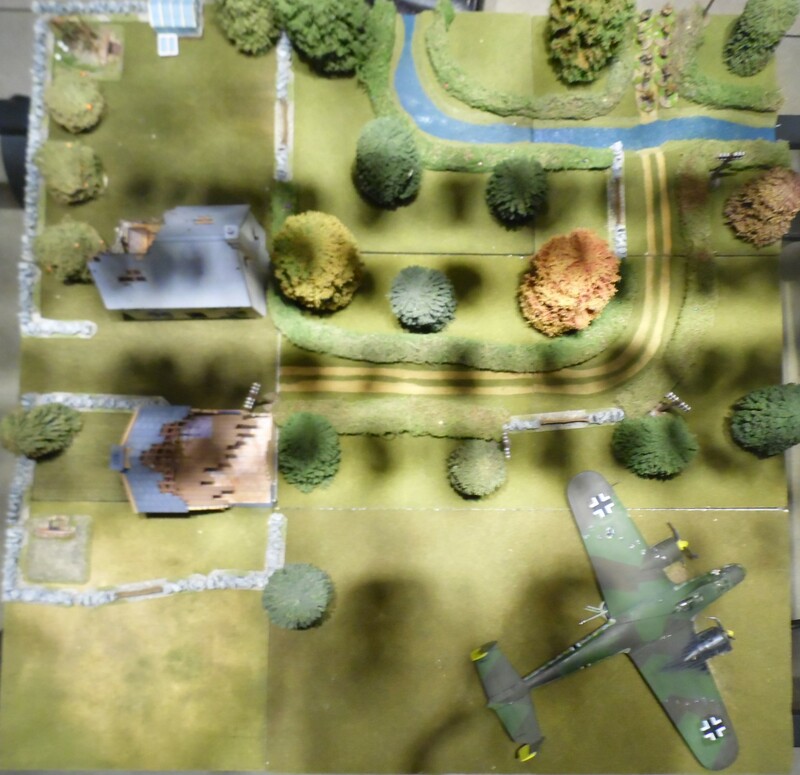 The rules we used were a slightly modified version of a free set from Panzer 8. 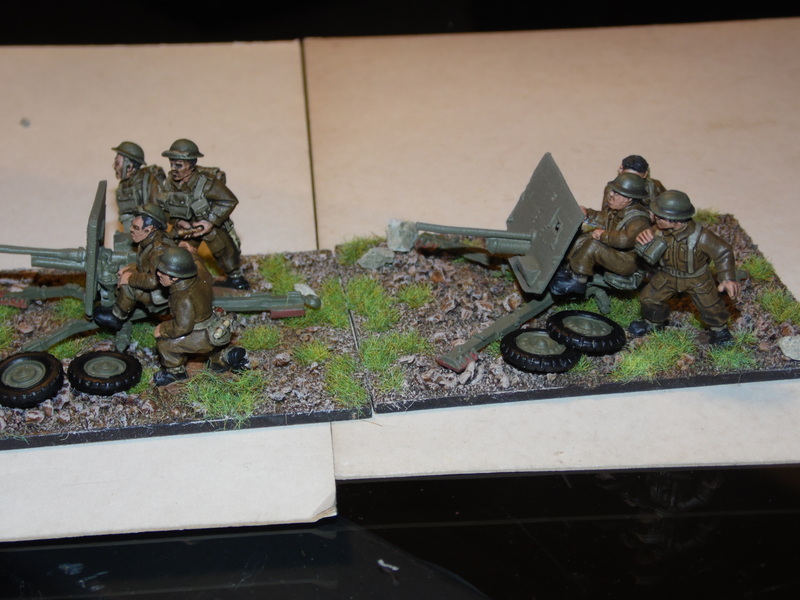 While these are aimed at 1/300 they were easily modified for 1/144 or 12mm. 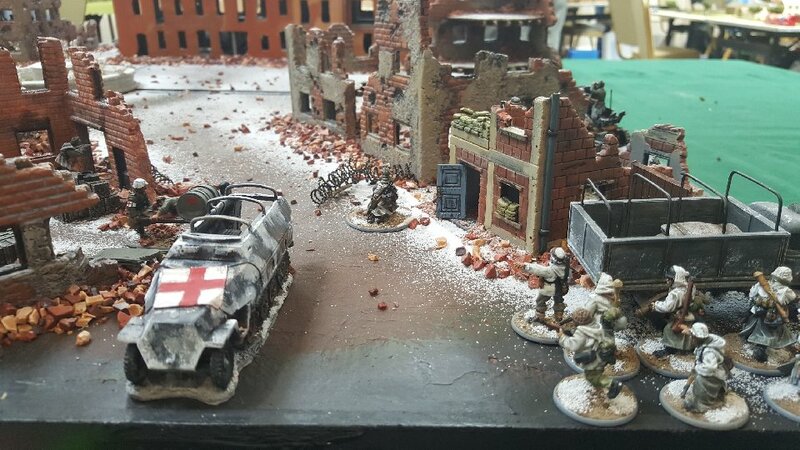 Here is the link http://panzer8.weebly.com/ Their rule sets are great fun and picked up in just a few turns. 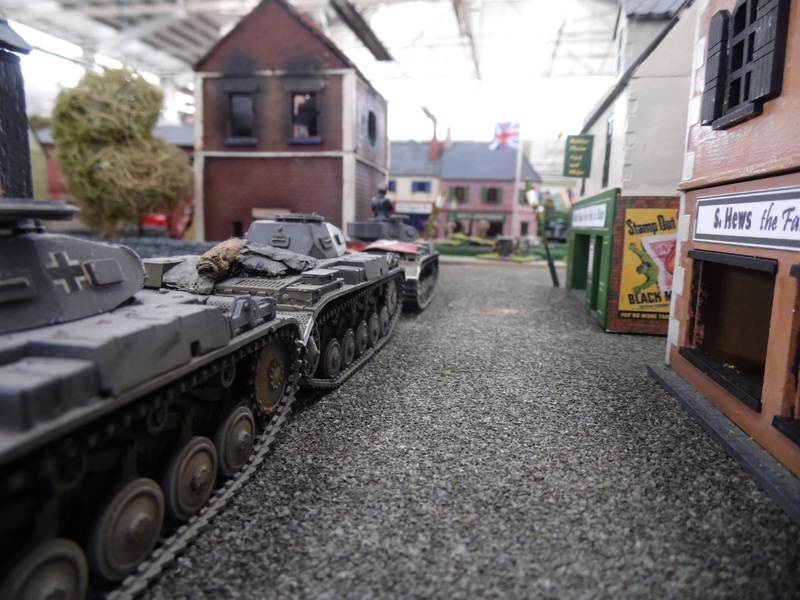 We had done a bit more research on the attack and defensive values of our tanks, infantry etc to get a better variety in the game. 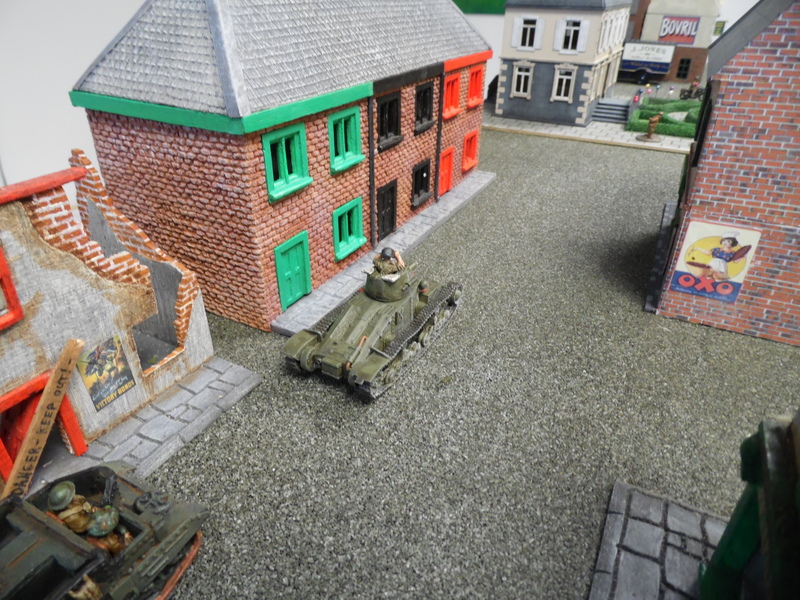 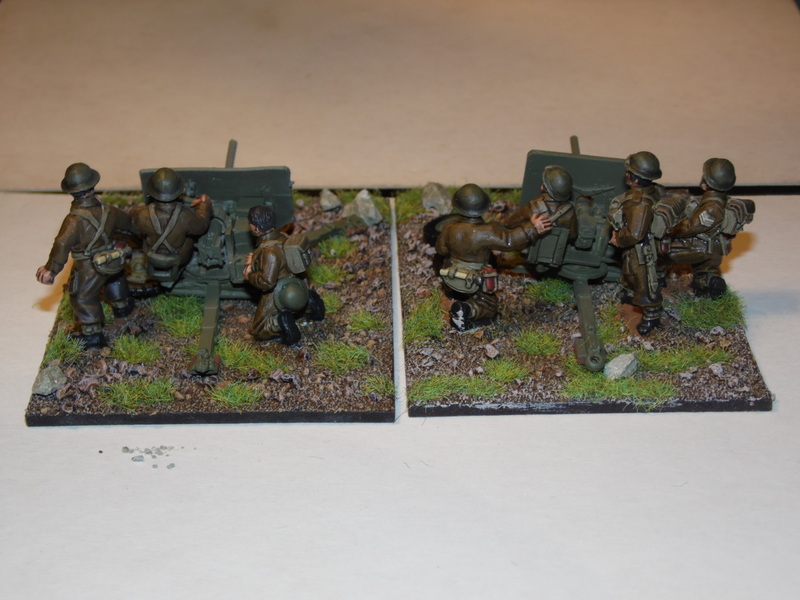 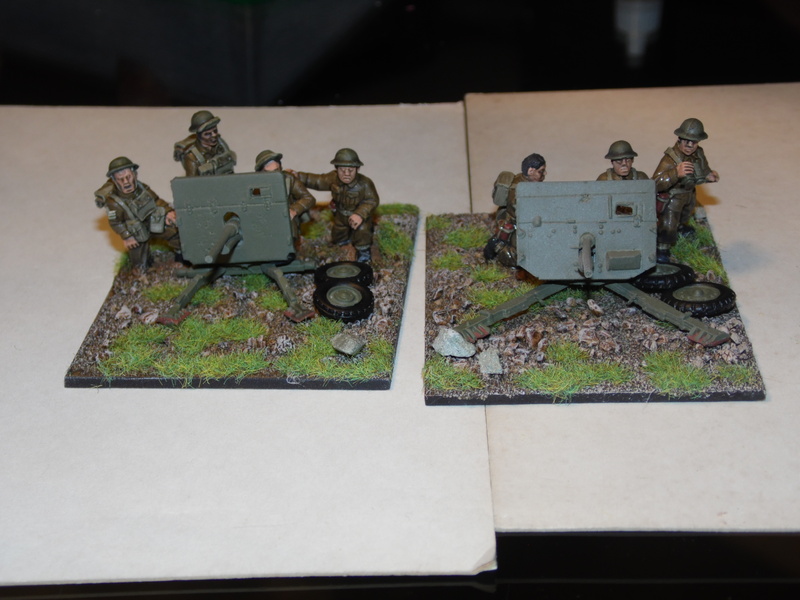 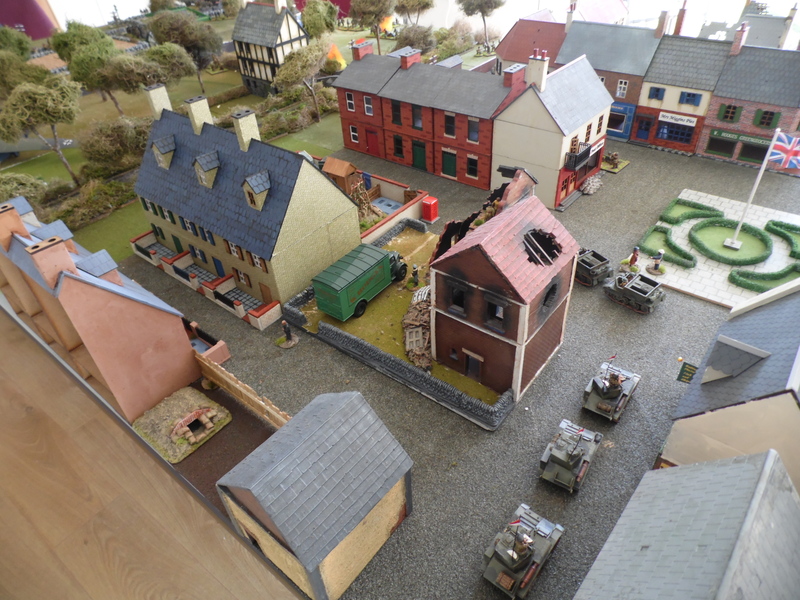 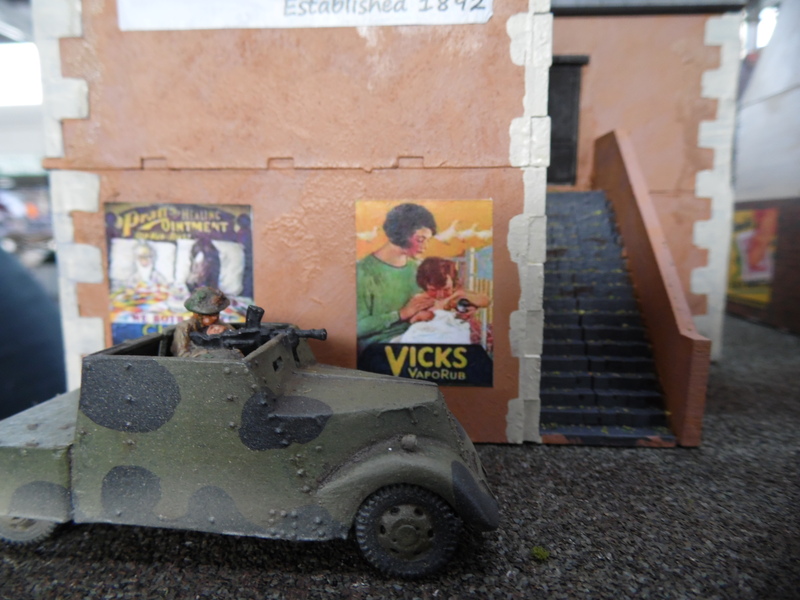 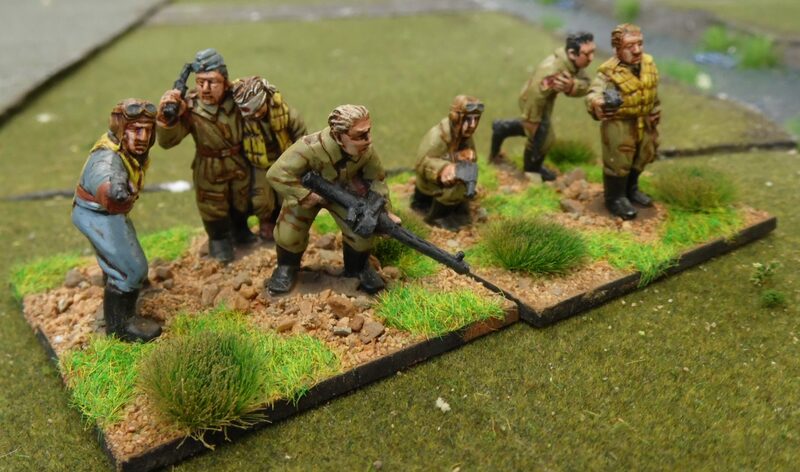 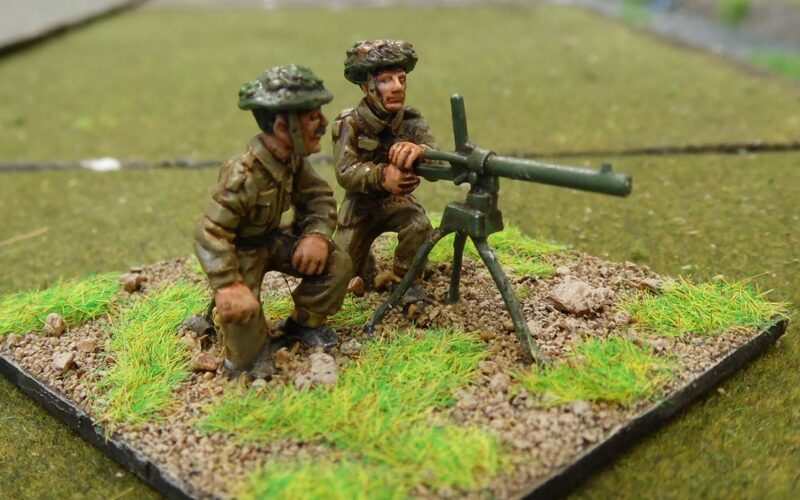 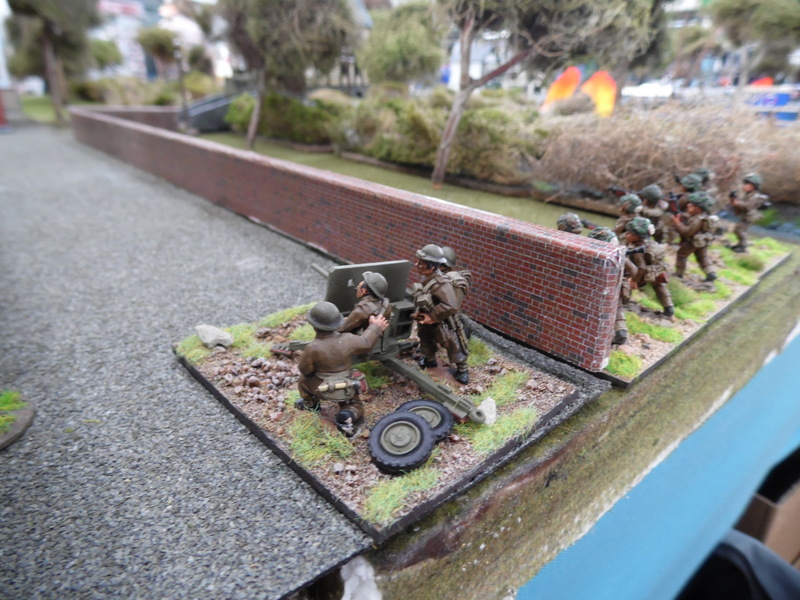 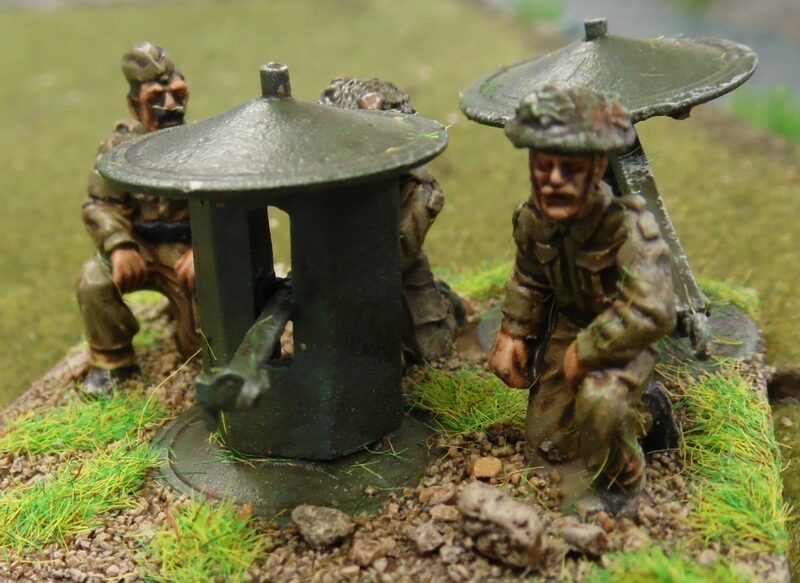 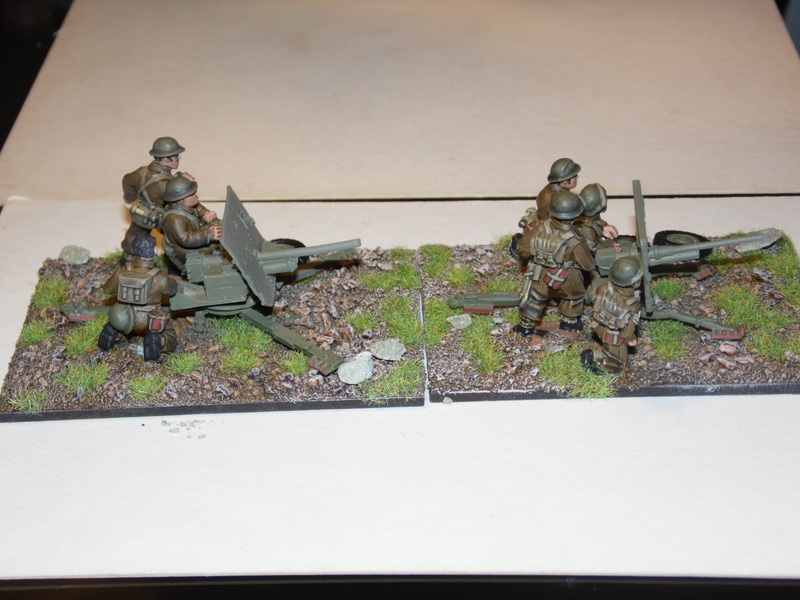 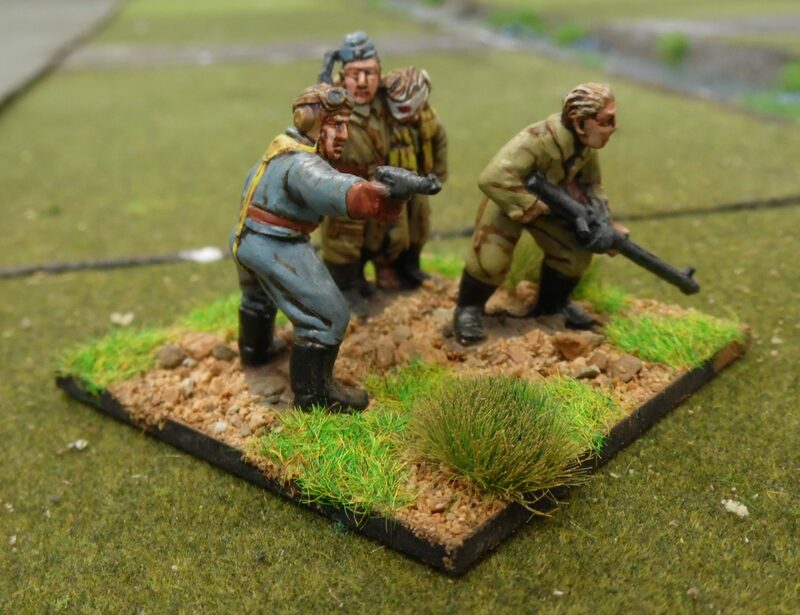 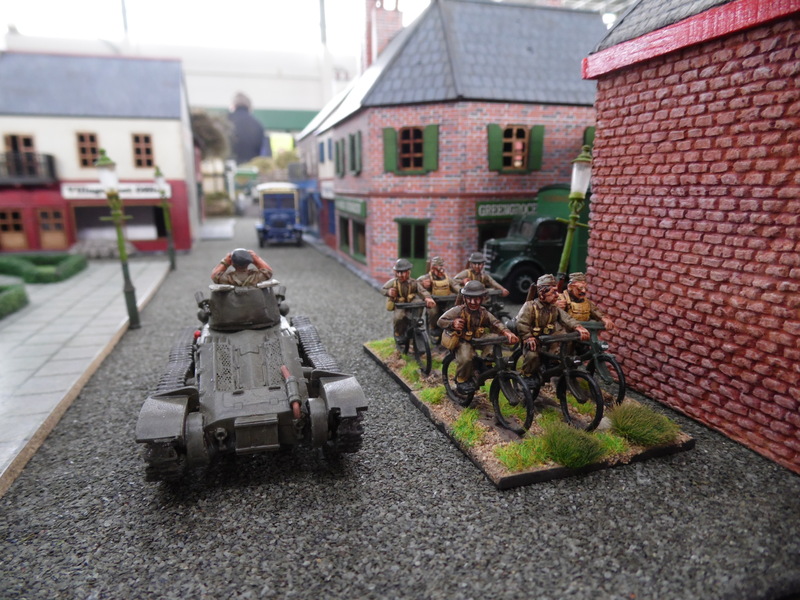 A great site we found to help was the GHQ WW2 Micro Armour rules site. 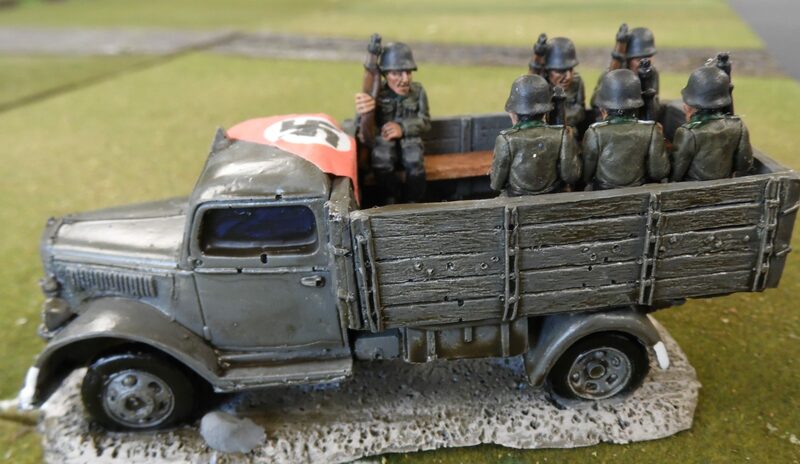 http://www.ghqmodels.com/pages/military/freestuff.asp This site has rules and vehicle, infantry specifications that saved so much time in research. 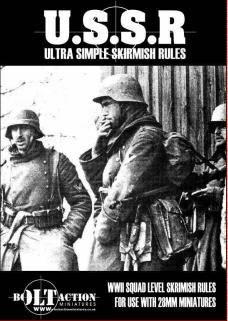 They also have scenarios for this and their other rule sets. 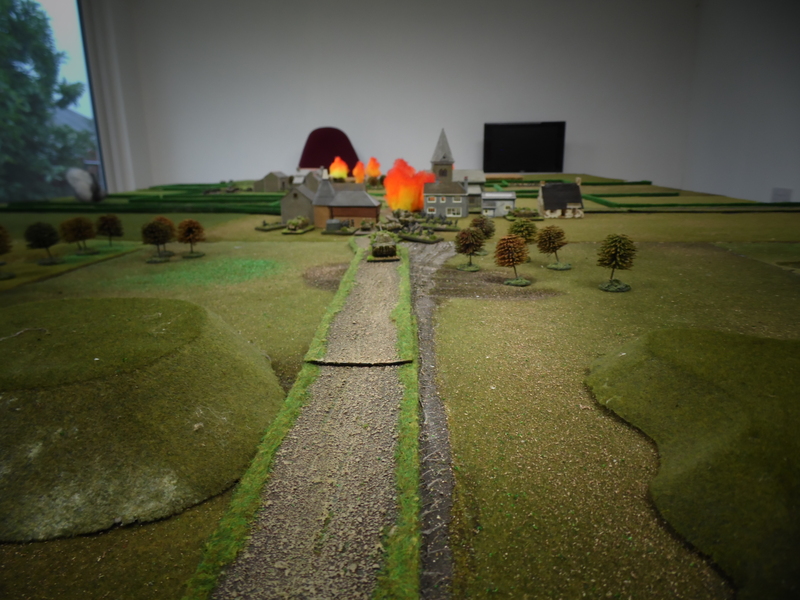 ( Really like their ACW Scenarios). 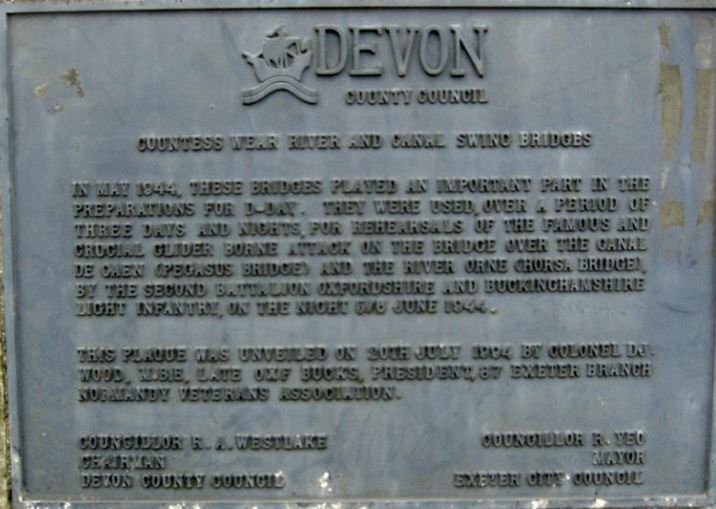 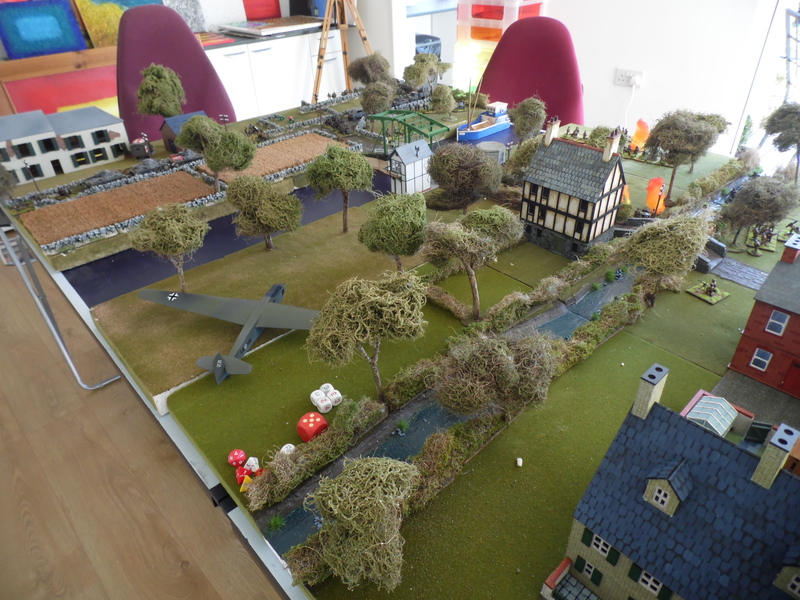 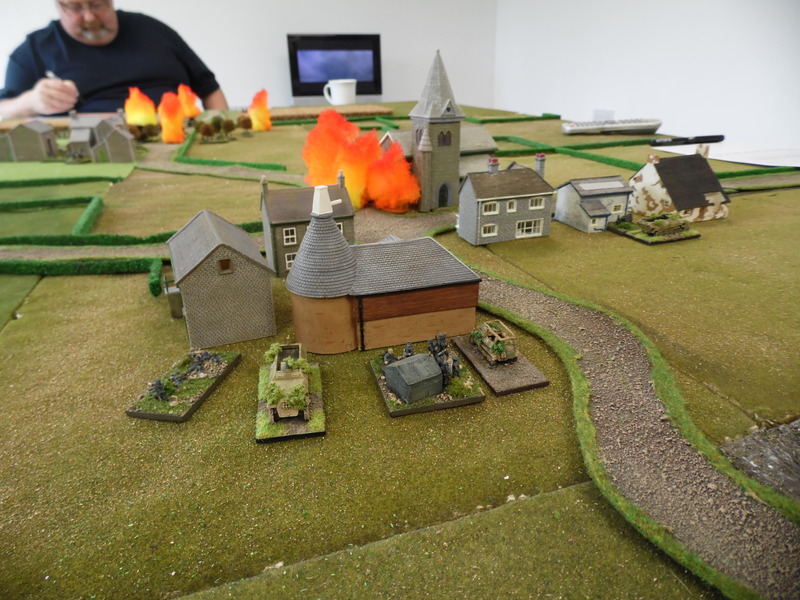 The Scenario was the introduction one contained in the Rapid Fire Wargame rules set – The battle of Lingeves 14th June 1944. 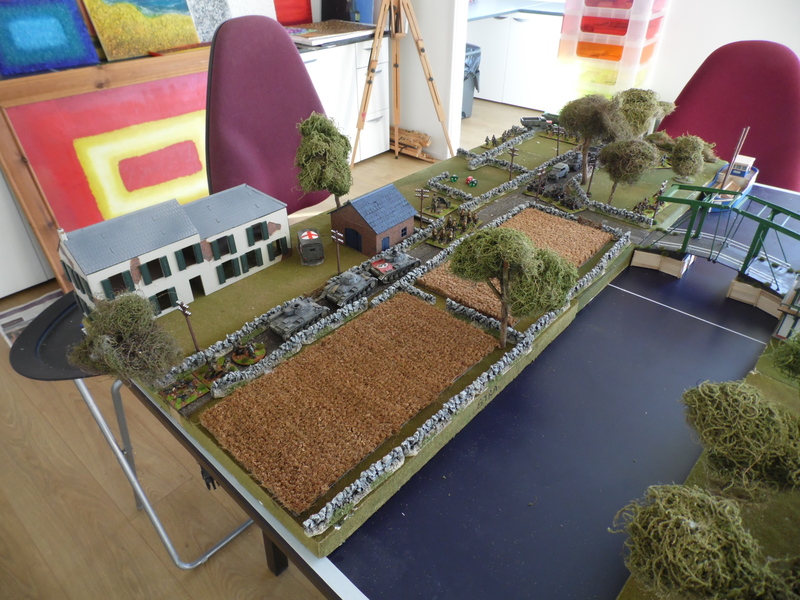 This had a British battalion with support advancing to take and hold a strategic village. 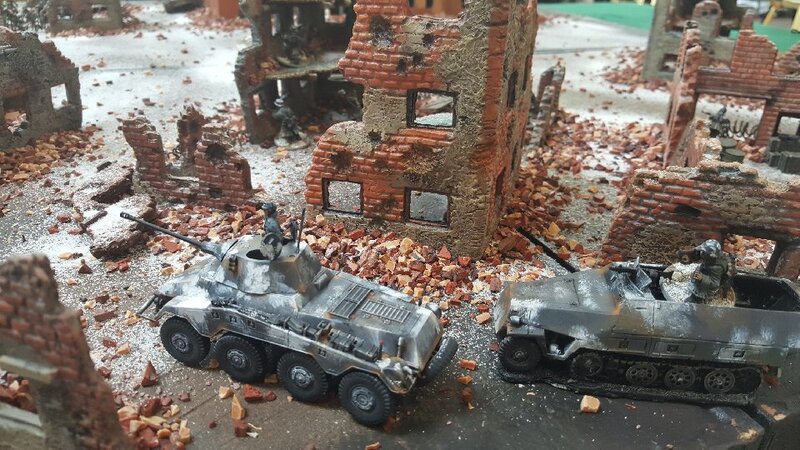 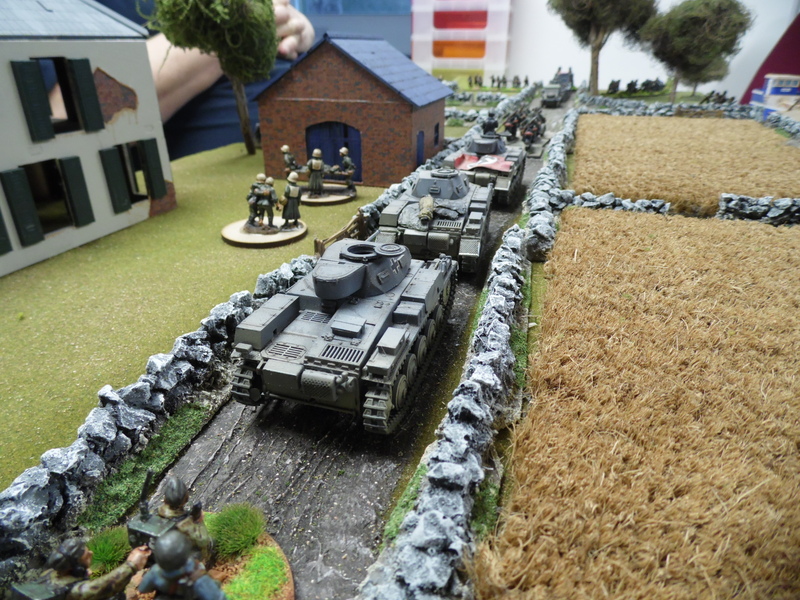 Unfortunately this was held by the 902nd Panzer Grenadier regiment with support from the 2nd Company 130th Panzer Regiment in the shape of a couple of Panthers! 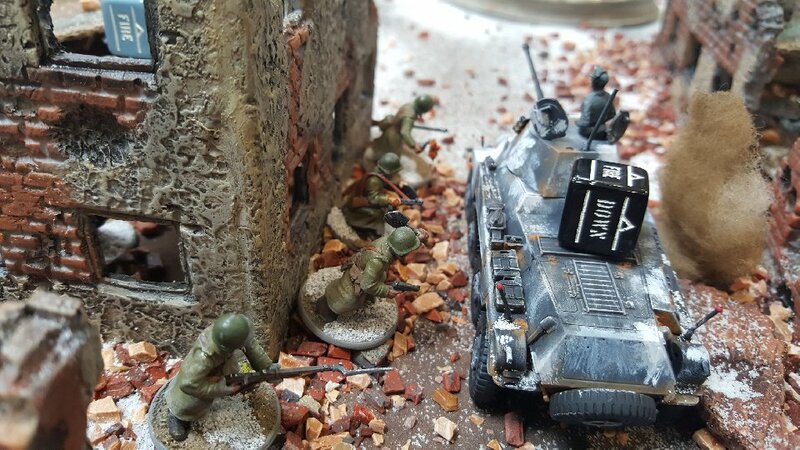 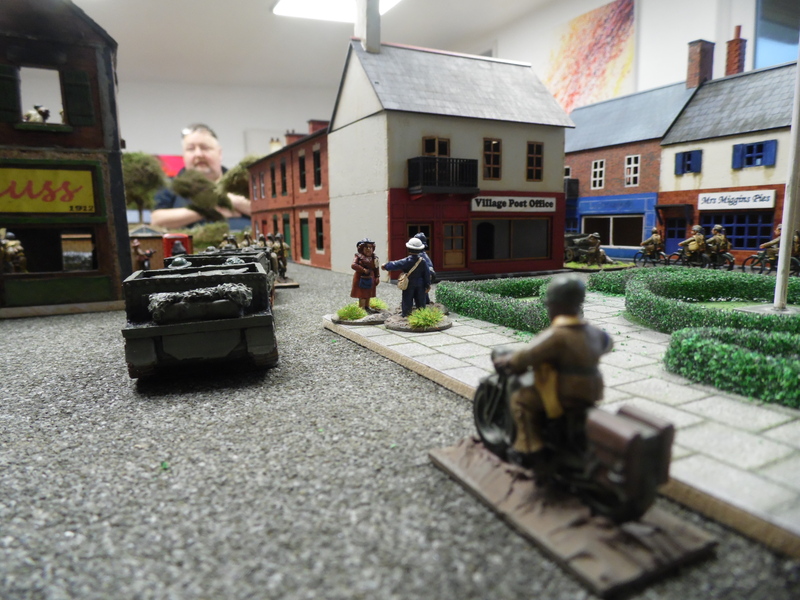 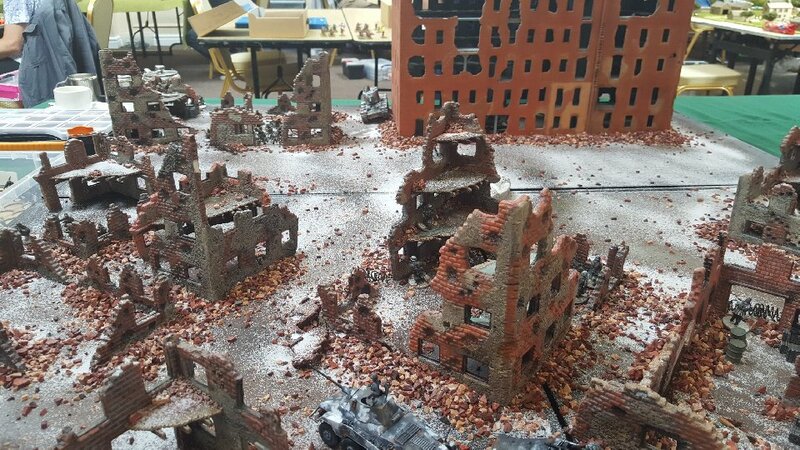 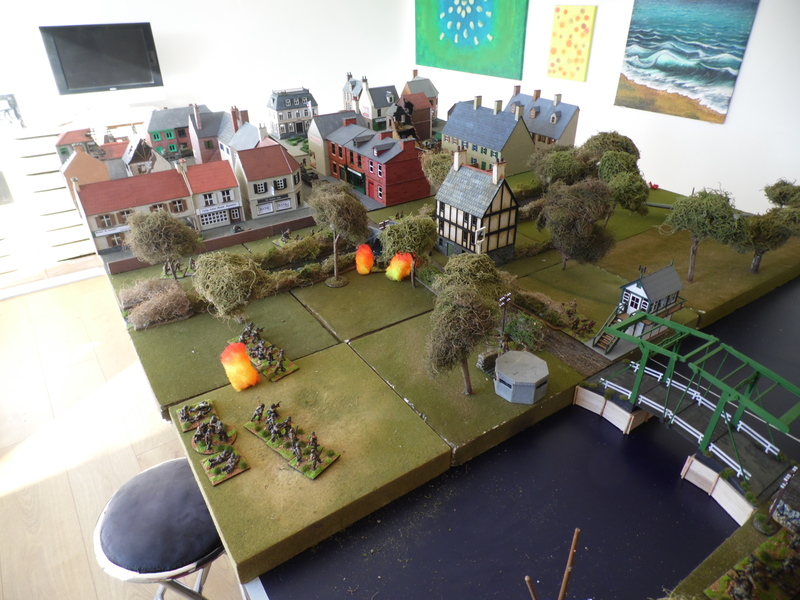 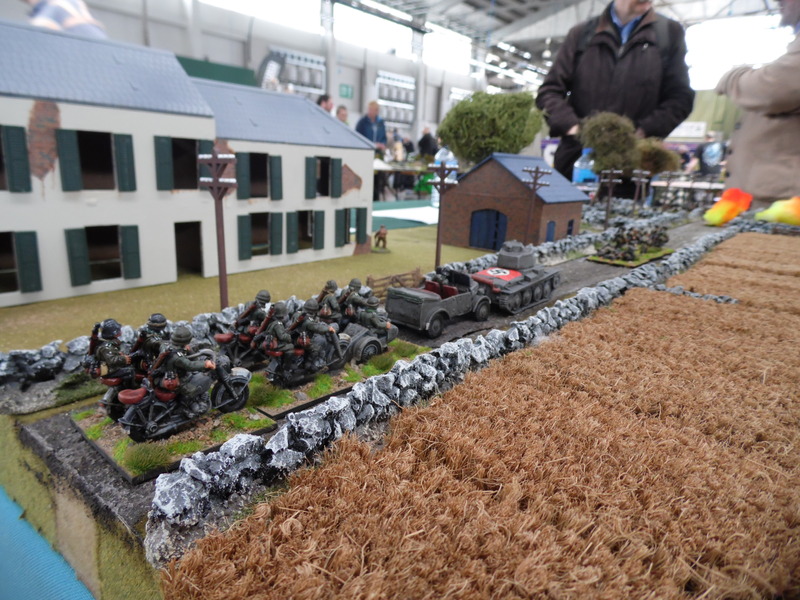 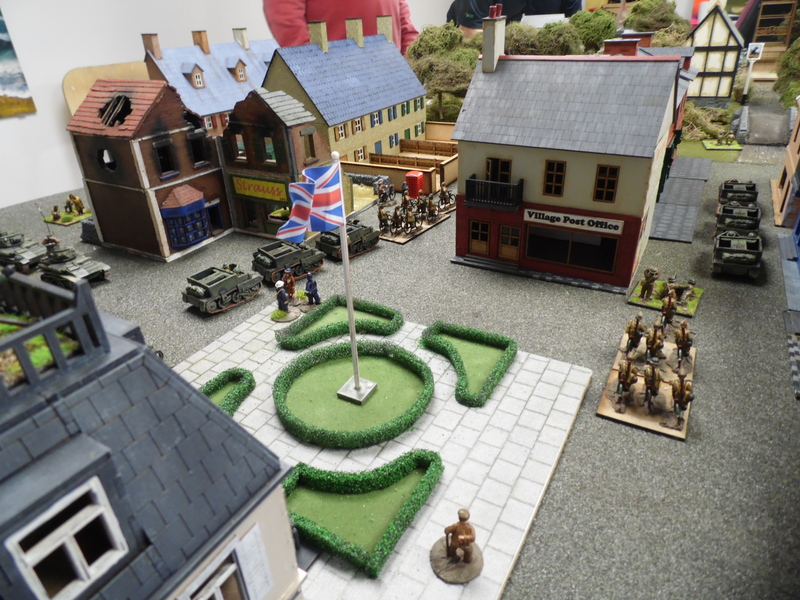 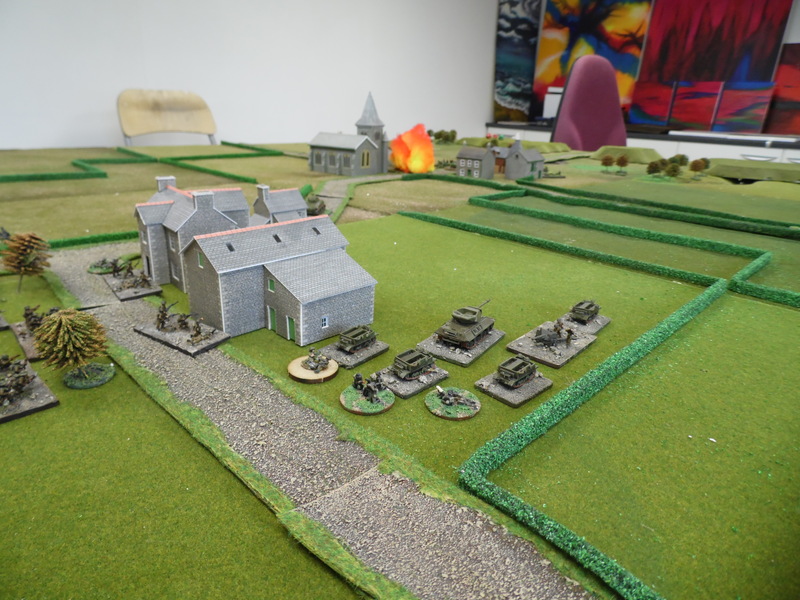 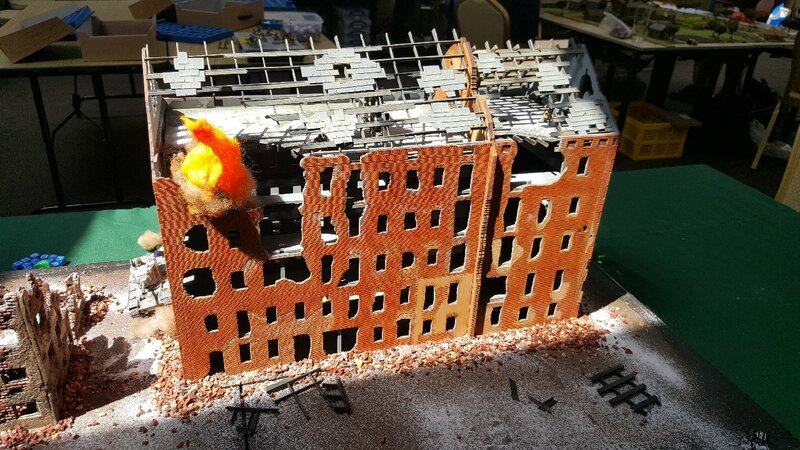 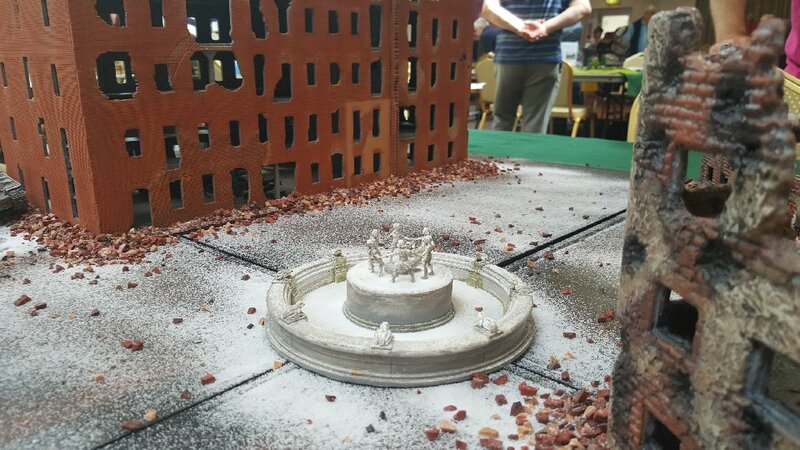 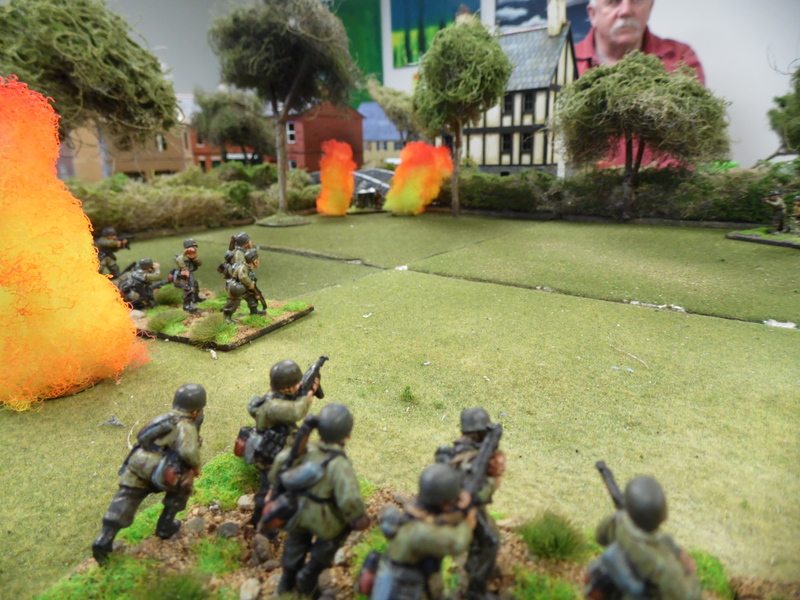 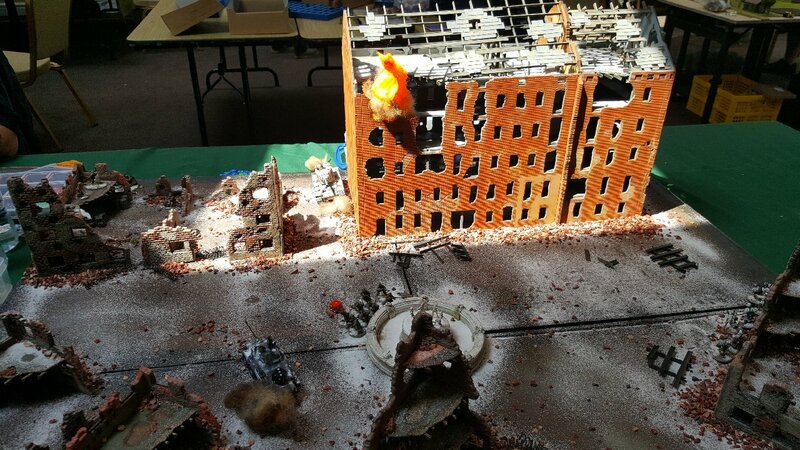 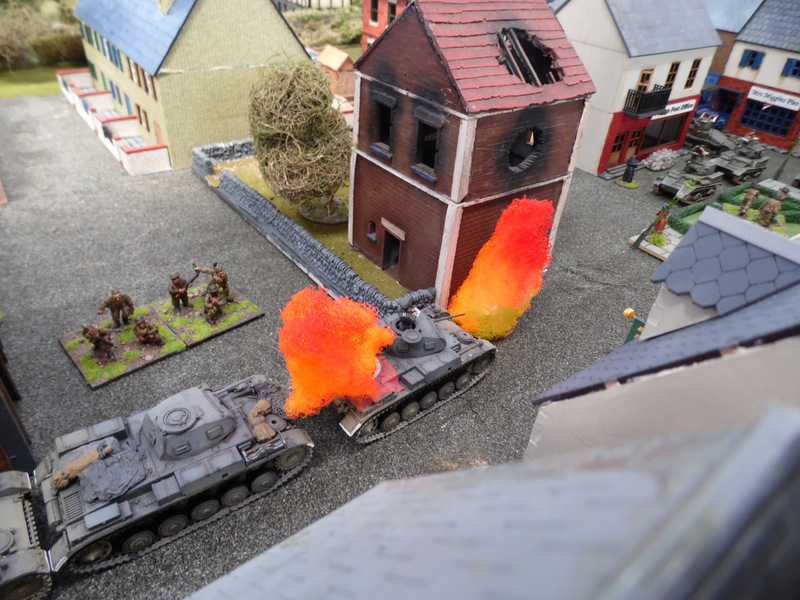 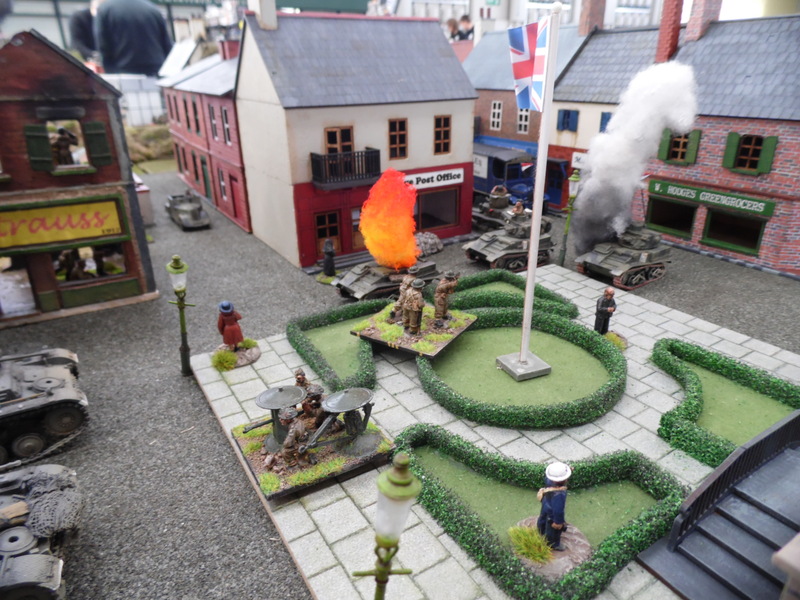 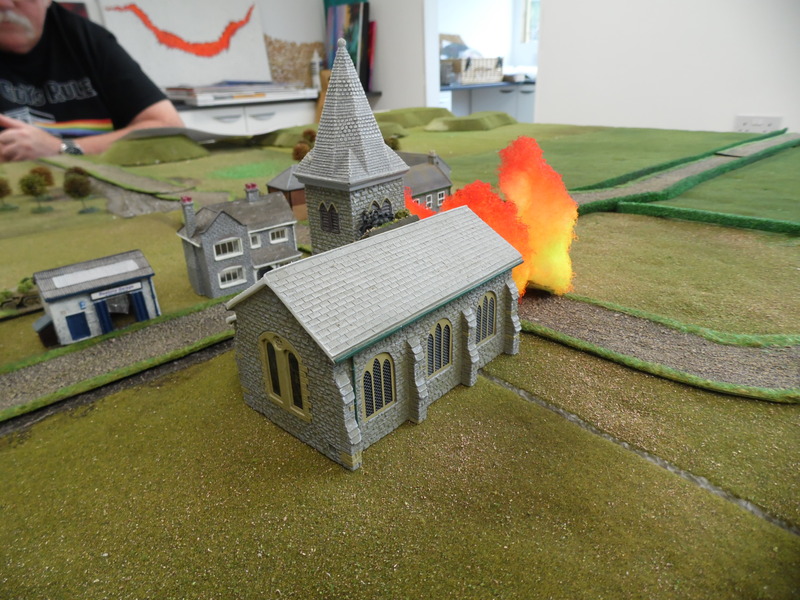 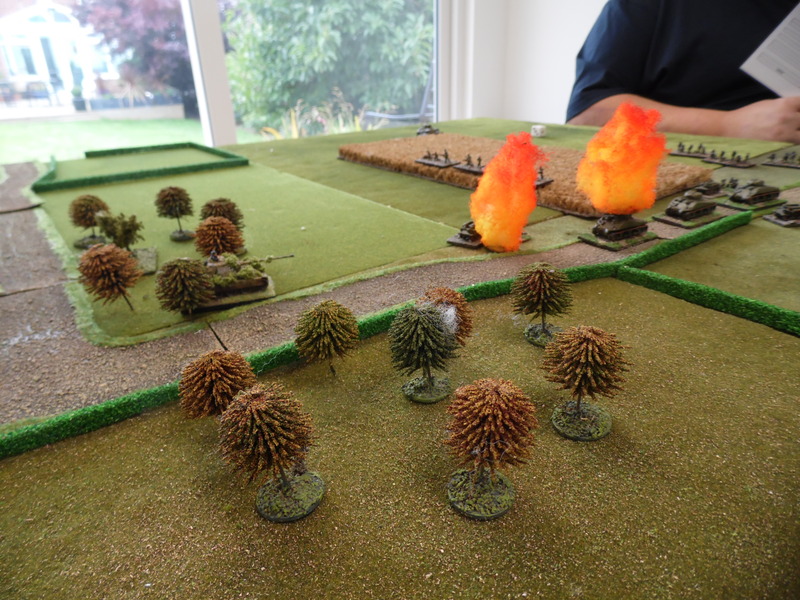 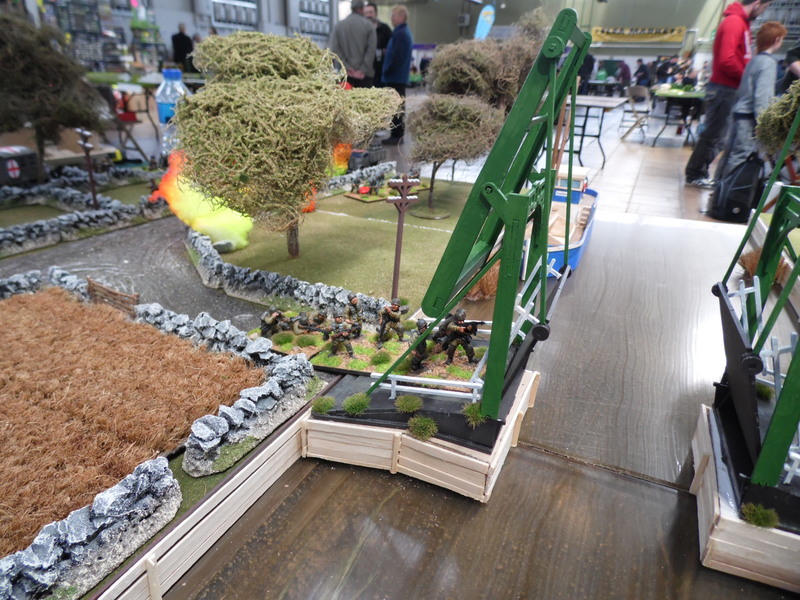 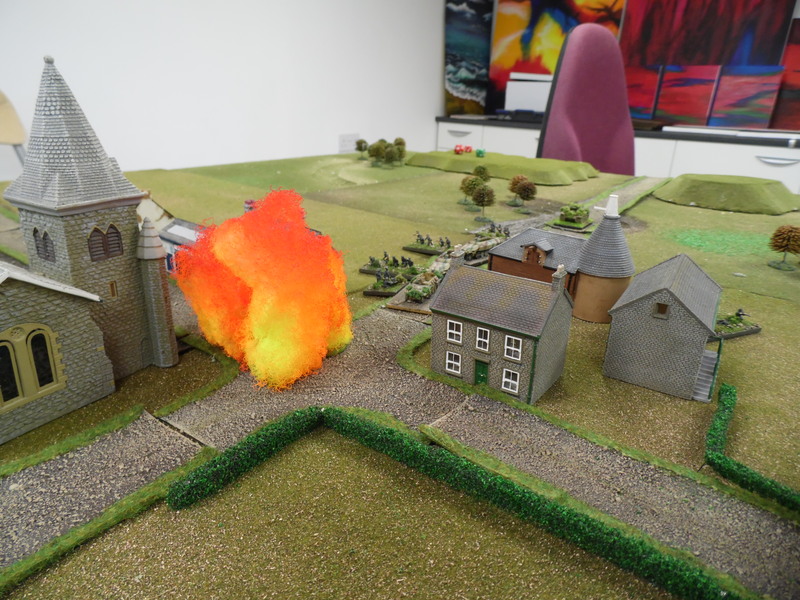 Game Overview – The British no sooner had advanced on to the table and cleared the cornfields when one of their carriers blew up in flames, This was closely followed by one of the supporting Shermans. 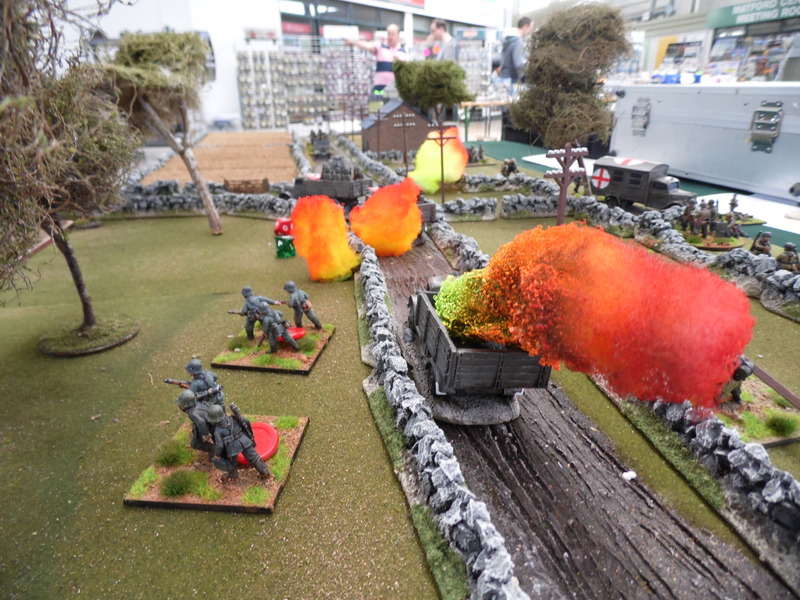 Turn one and a Carrier and Sherman already a blaze! 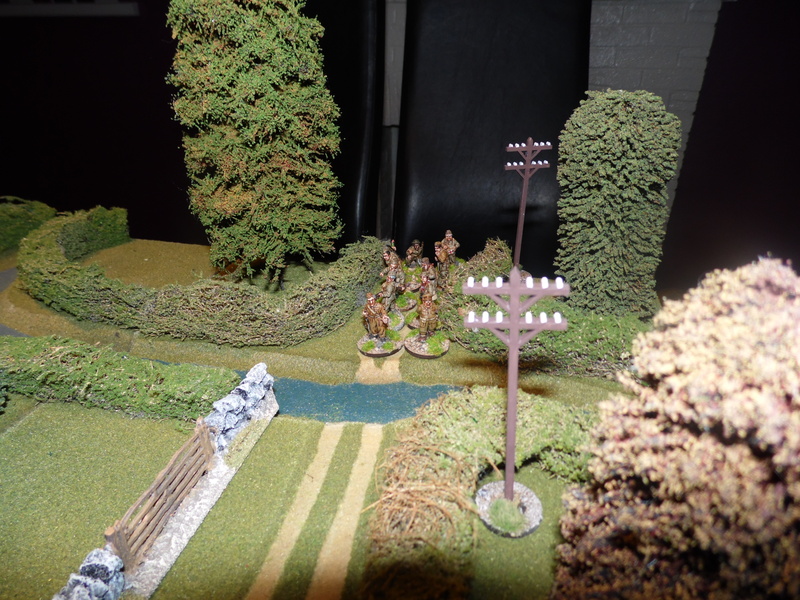 Panther can be seen on the edge of the woods. 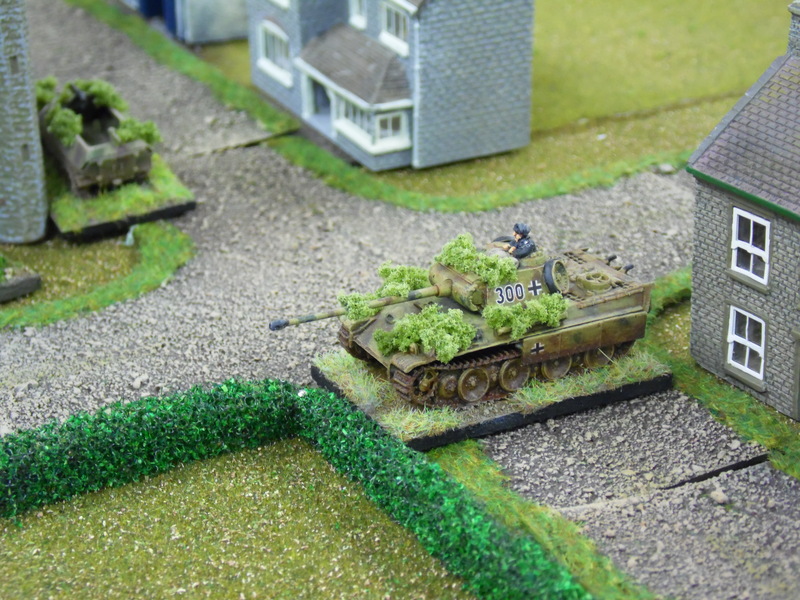 British bought their infantry forward and attempted to enter the woods and clear the Panther. 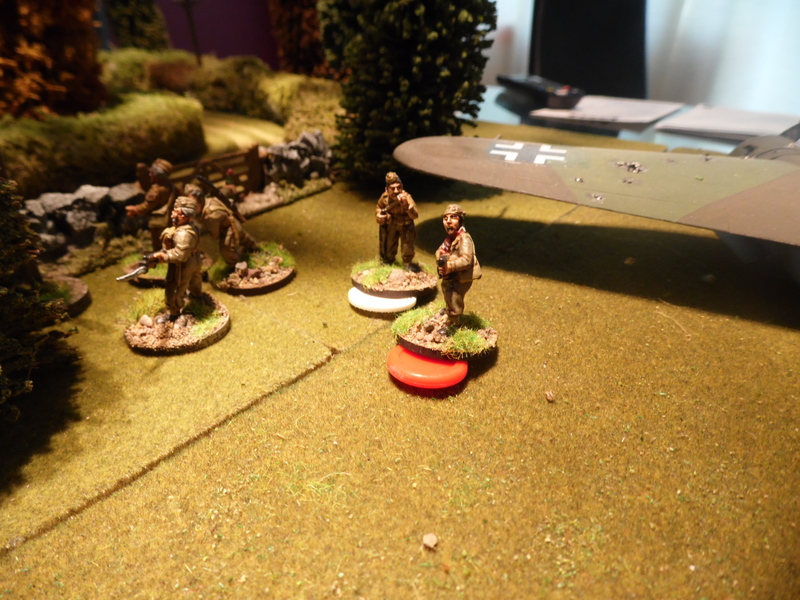 Here they ran into a Panzer Grenadier Company. 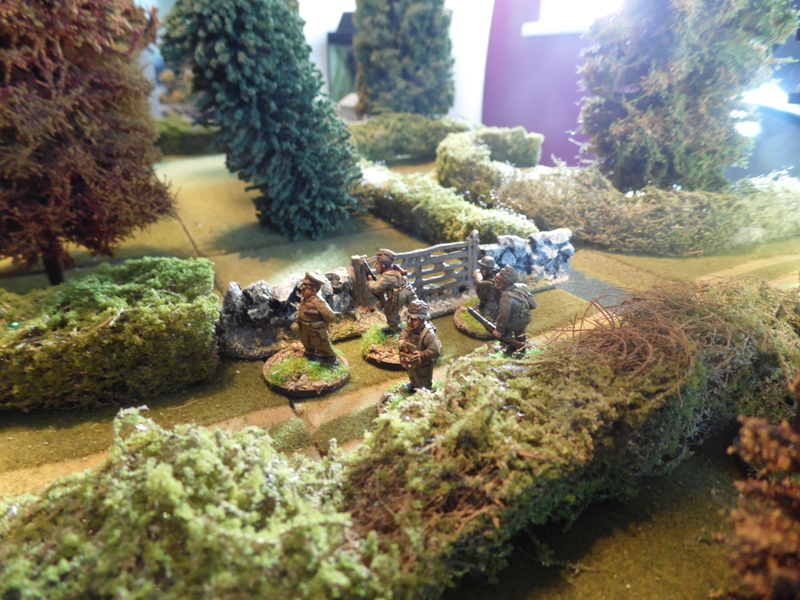 After a brief firefight they drove out the Germans and took out the panther with a PIAT. 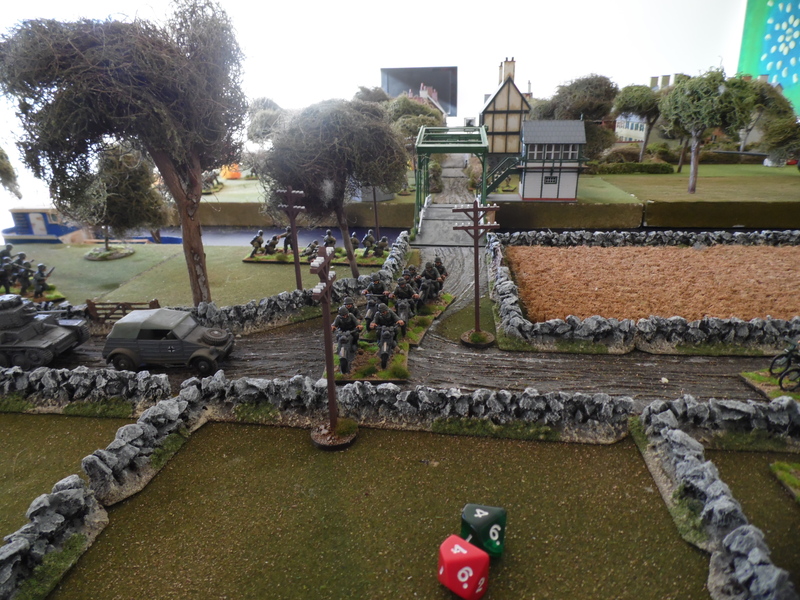 British clear the woods and advance on to the farm. 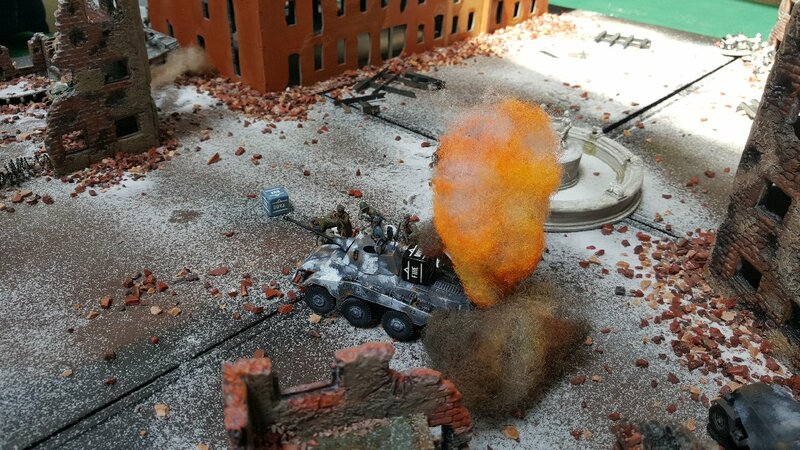 Burning wreck on Panther in the background. 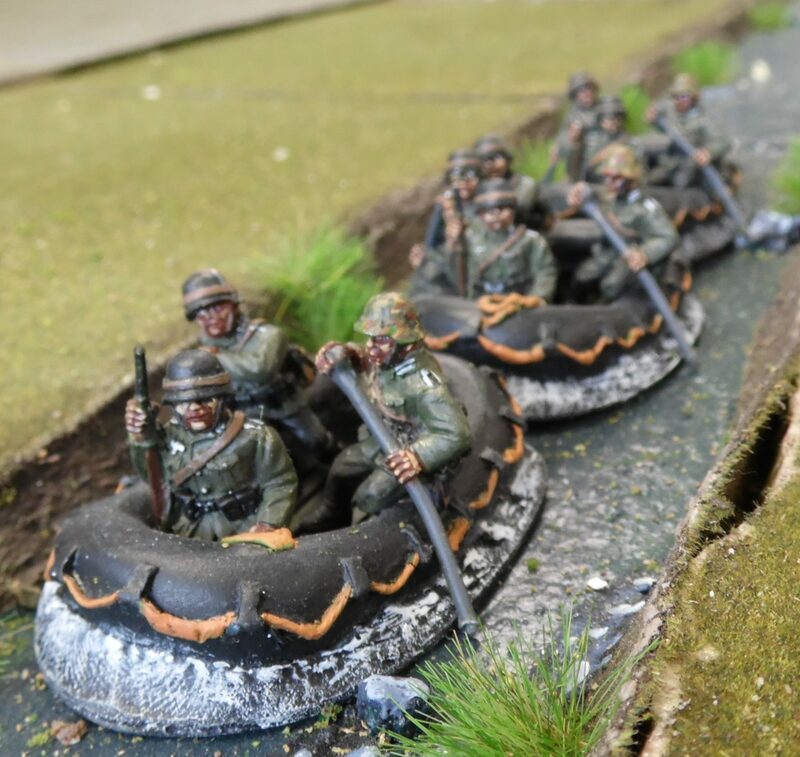 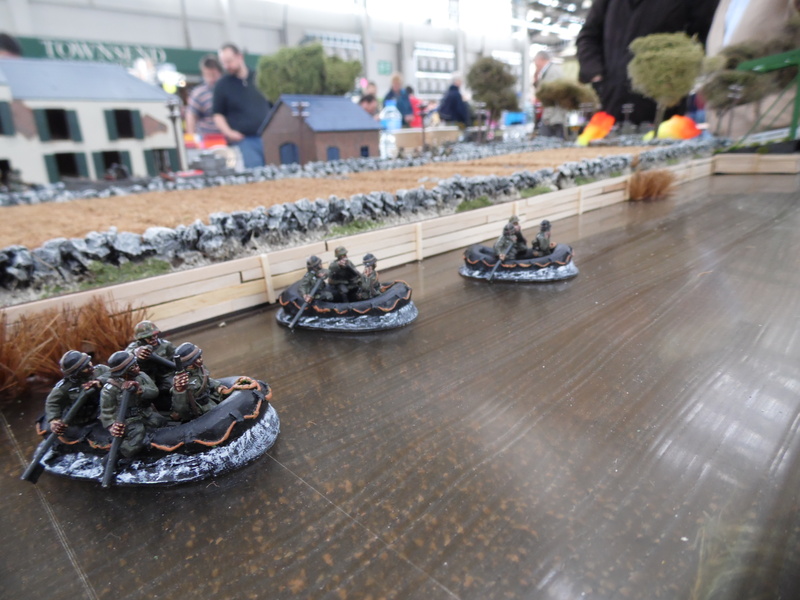 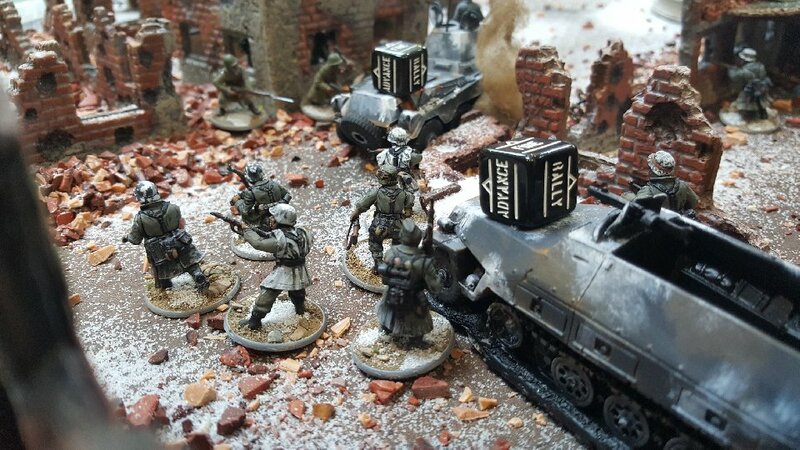 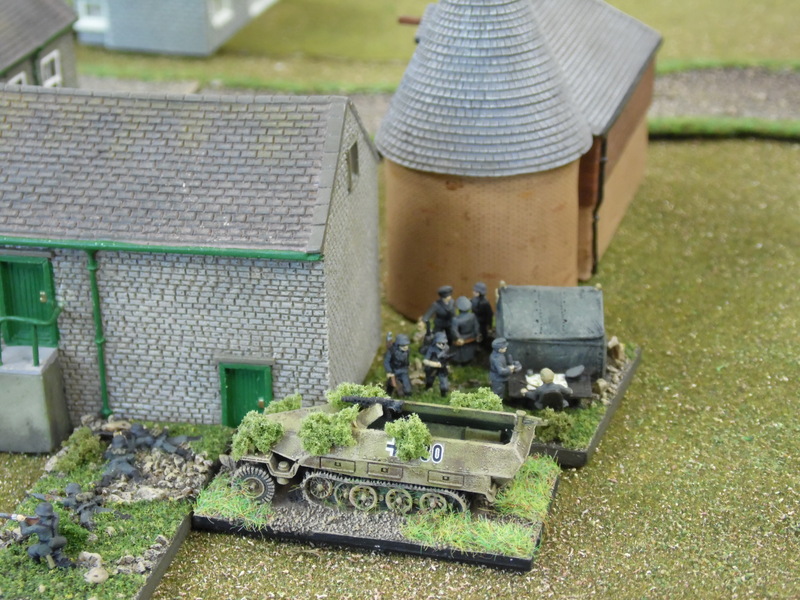 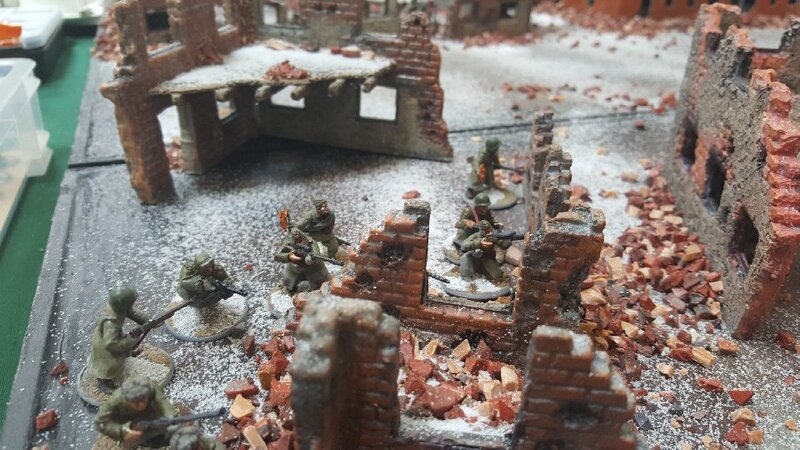 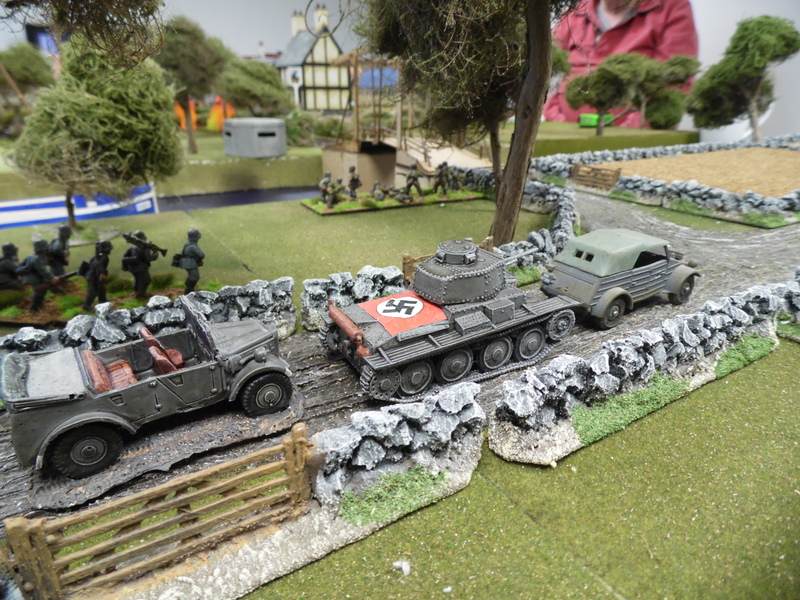 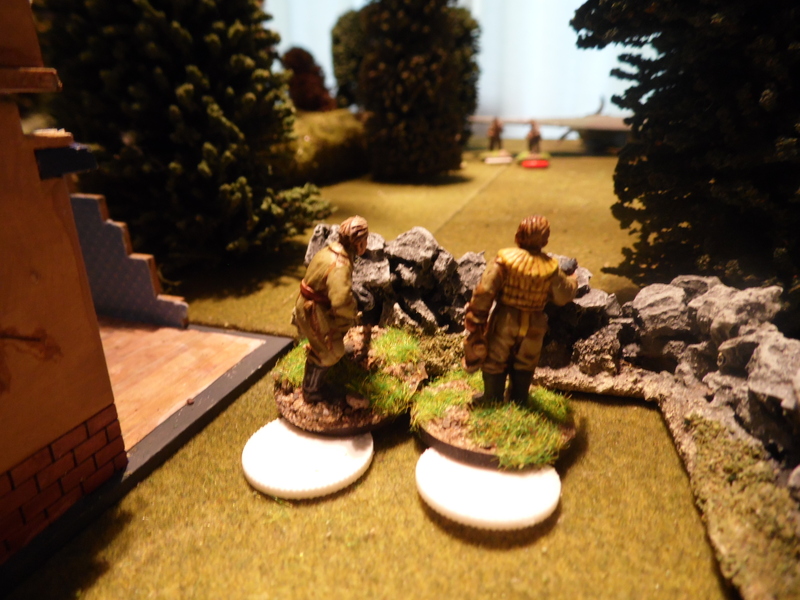 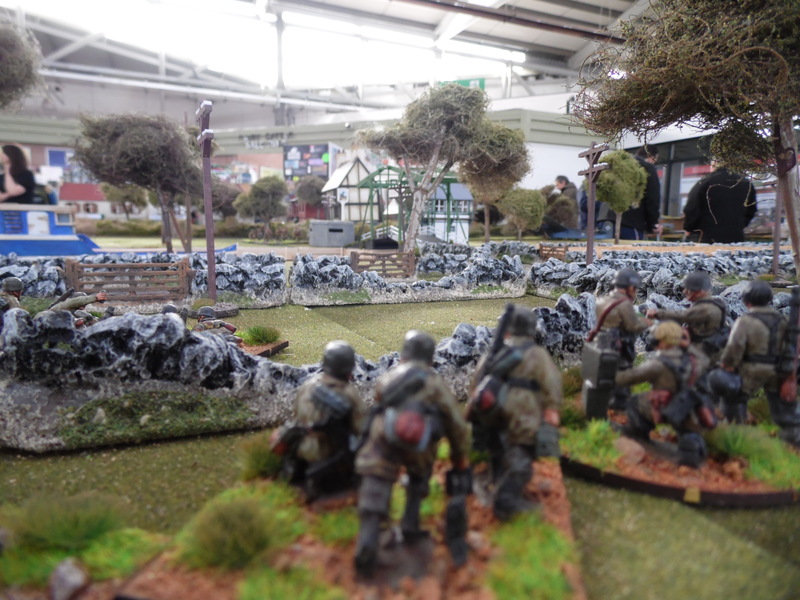 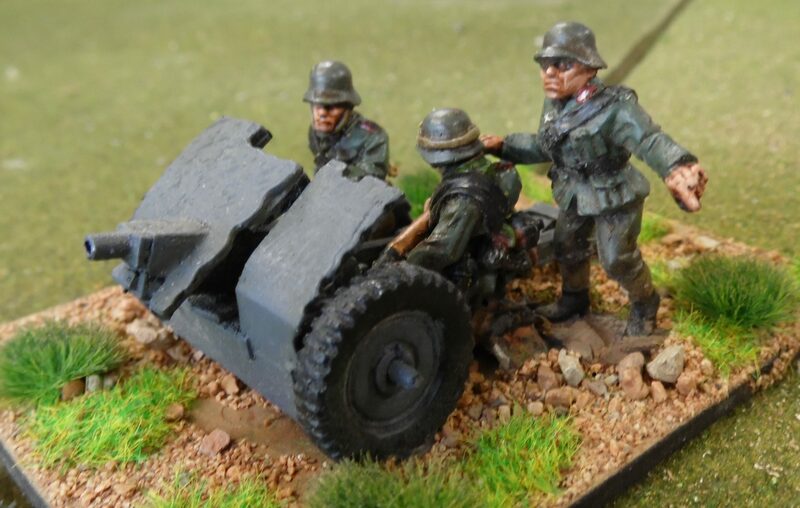 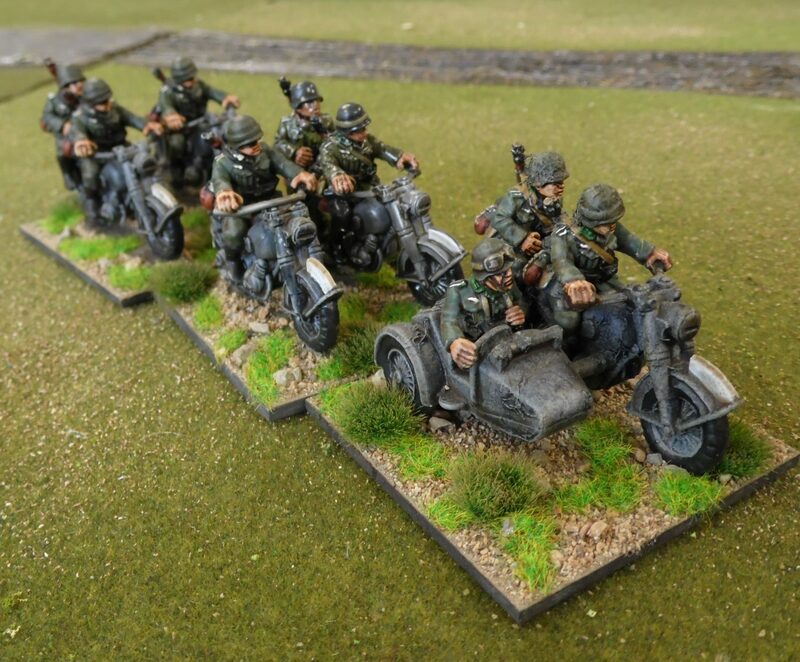 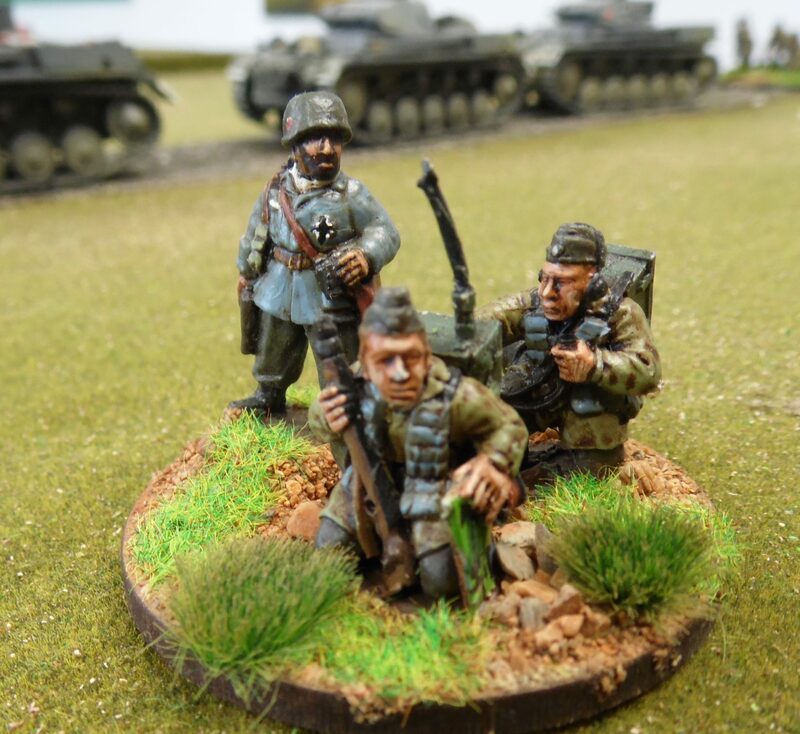 Panzer Grenadiers holed up around the farm. 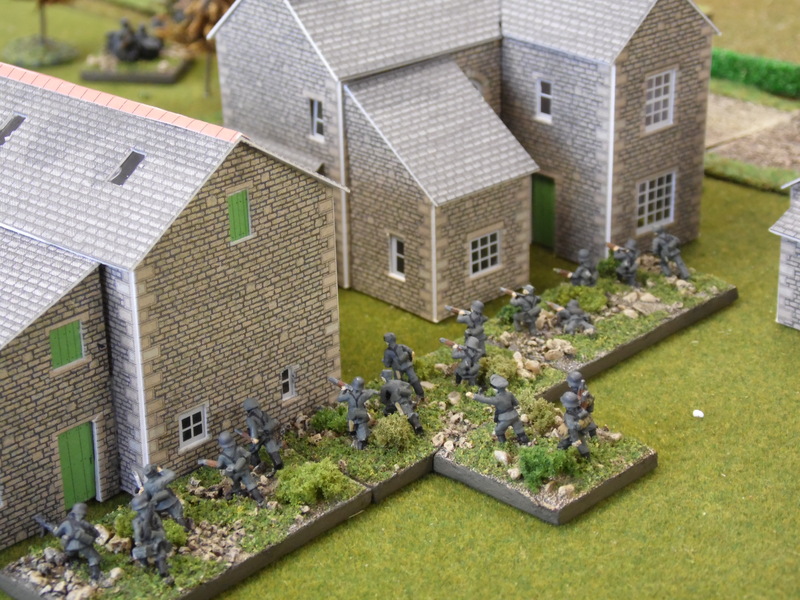 British pushed on and after a bitter firefight saw them clear the farm. 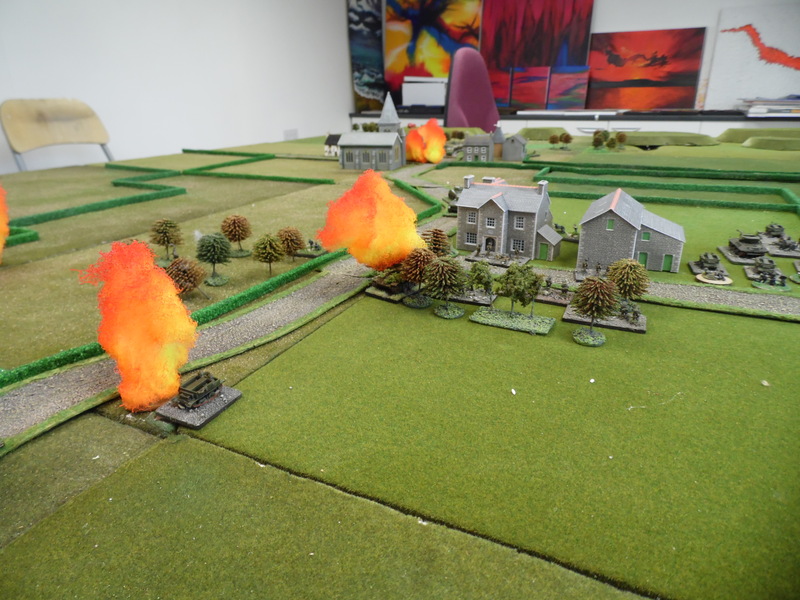 They had also established contact with their artillery support which was starting to lay down some fire on the cross roads, Their next target. 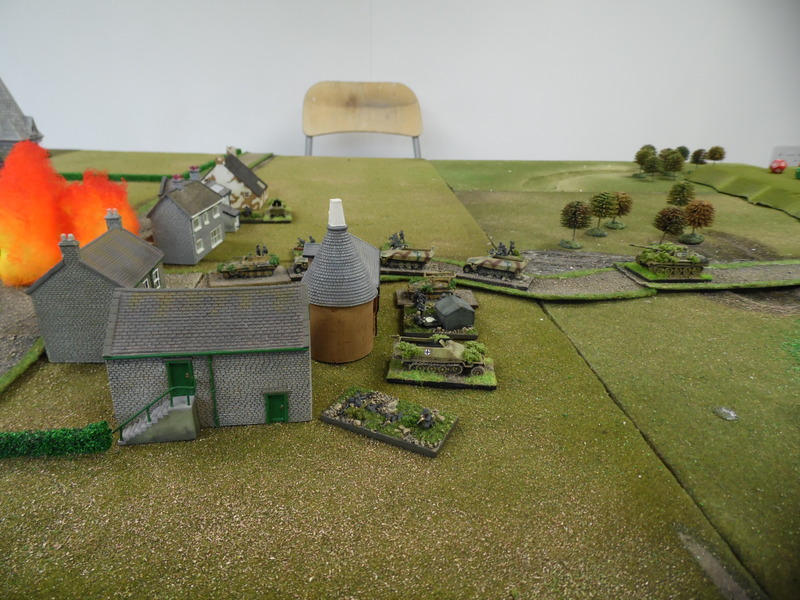 German reinforcements nearly hit by British artillery. 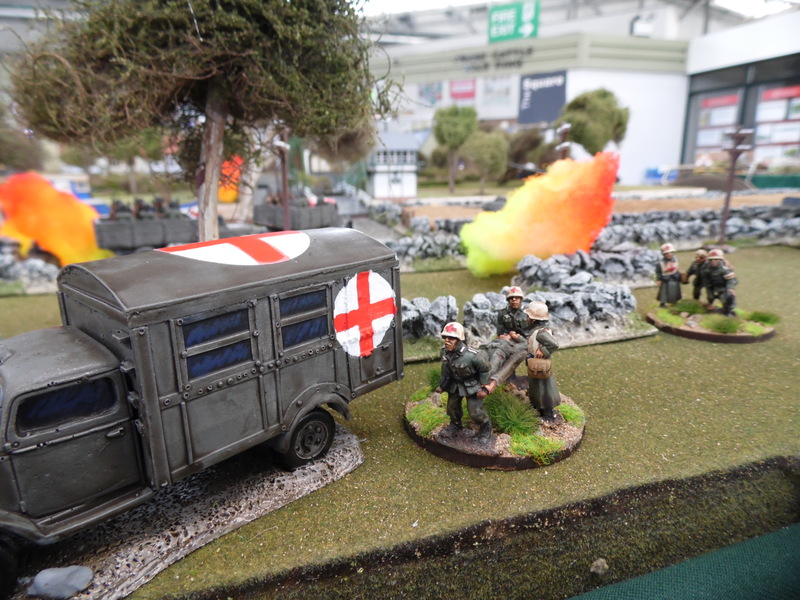 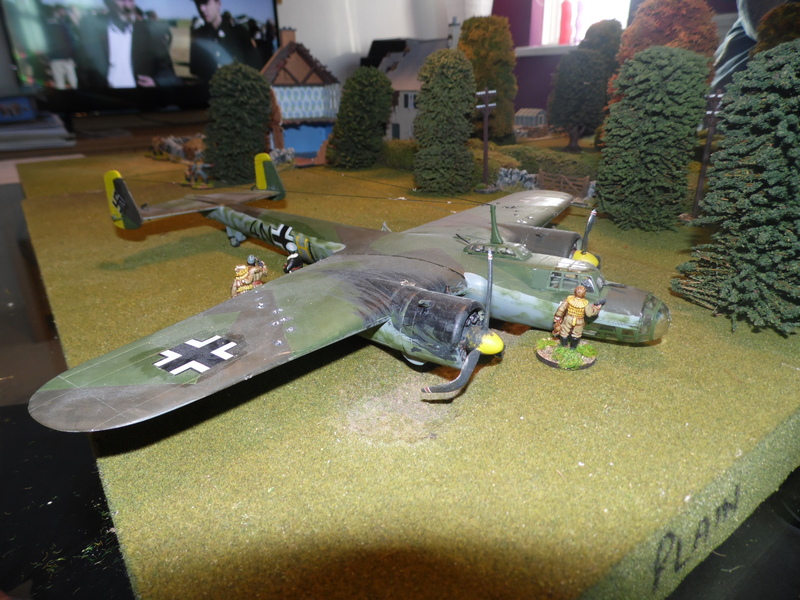 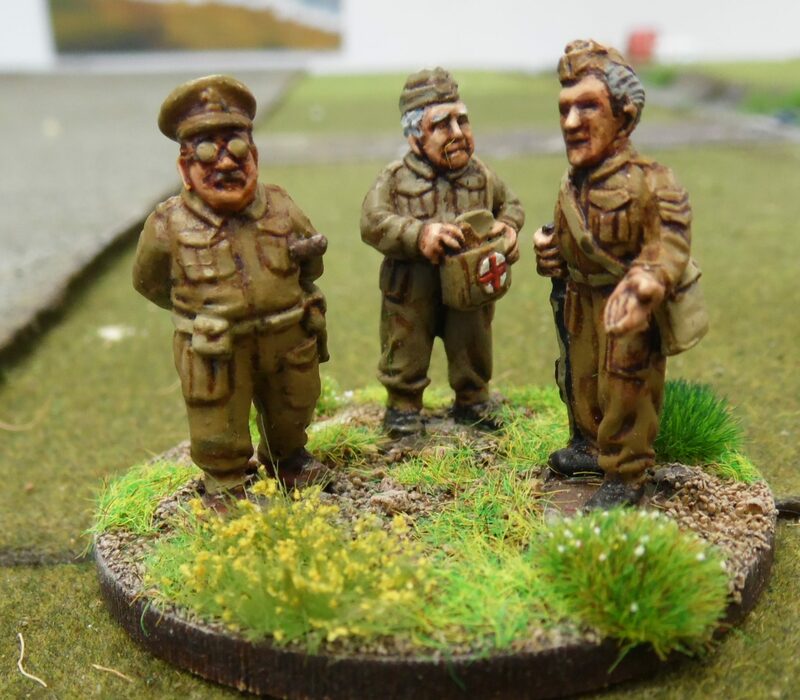 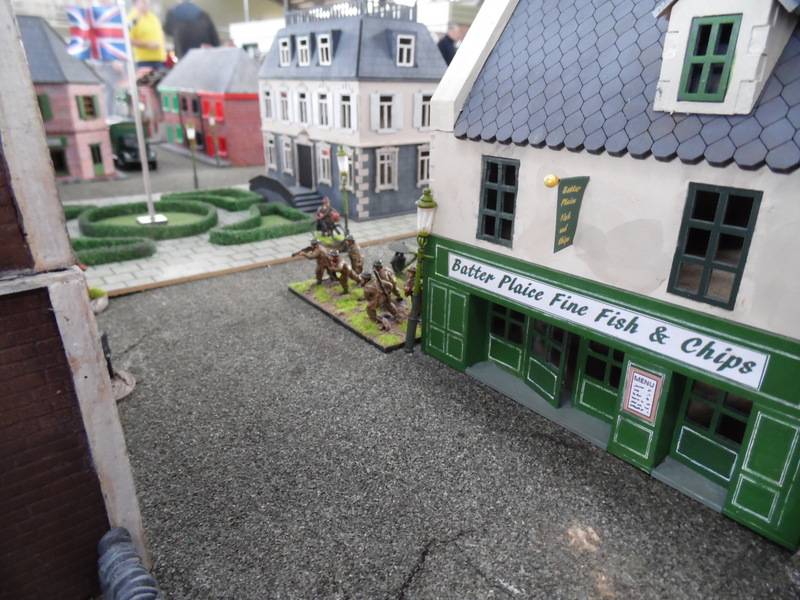 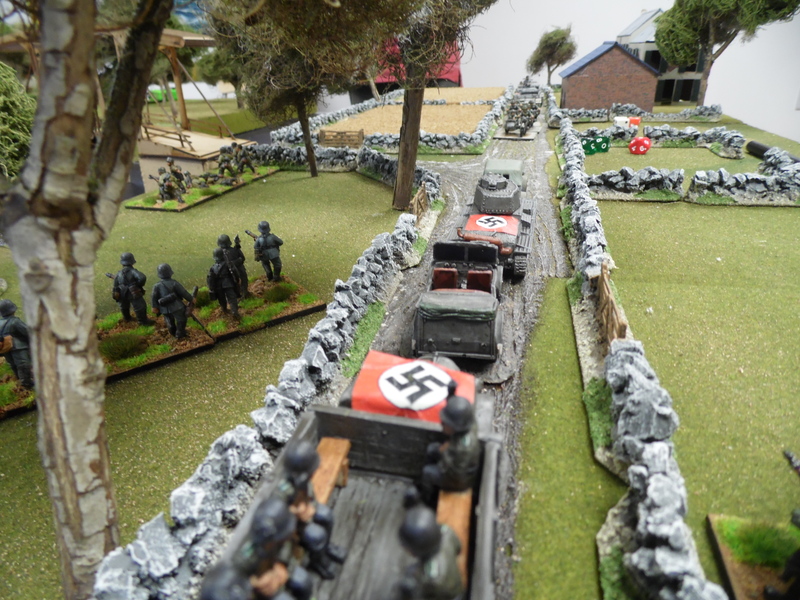 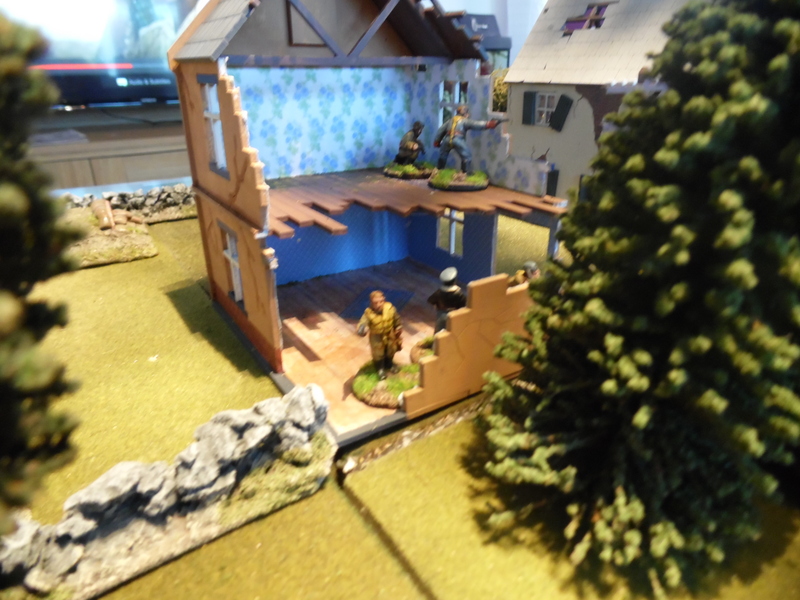 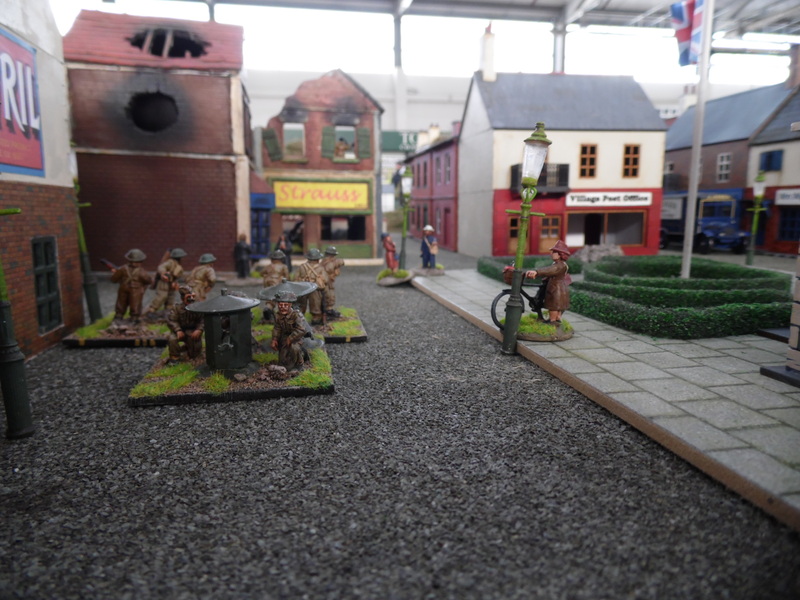 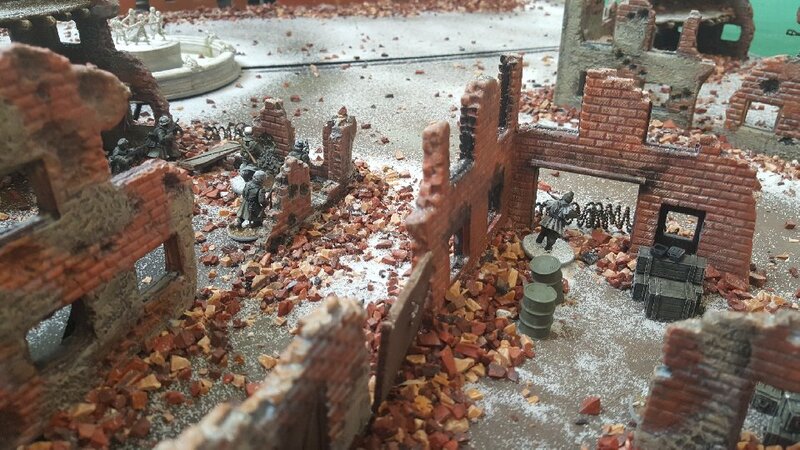 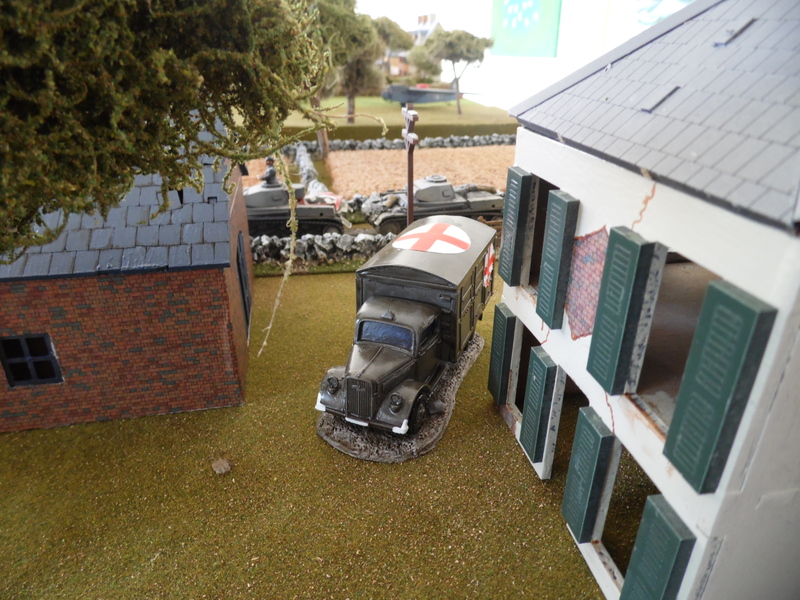 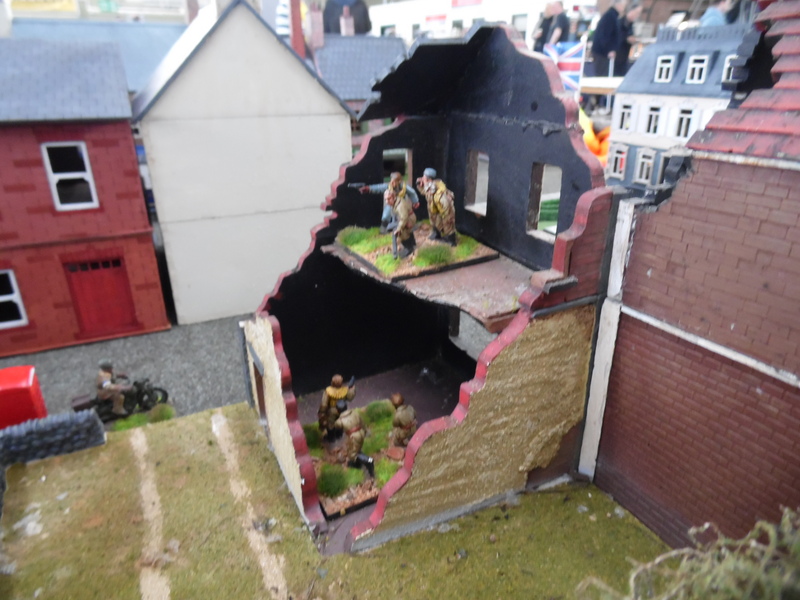 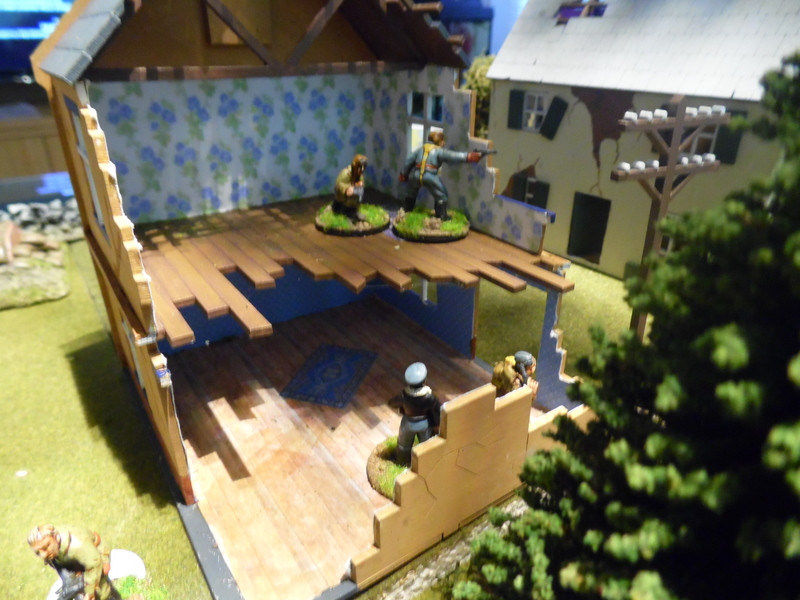 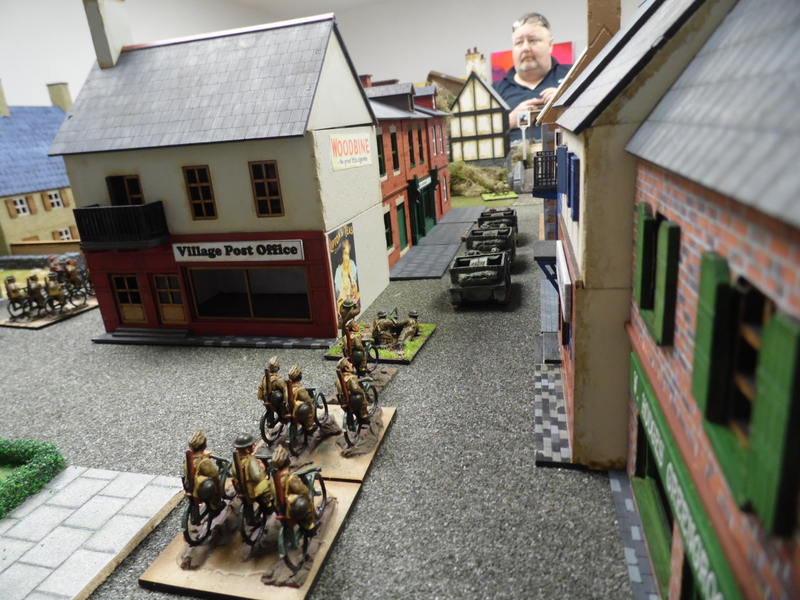 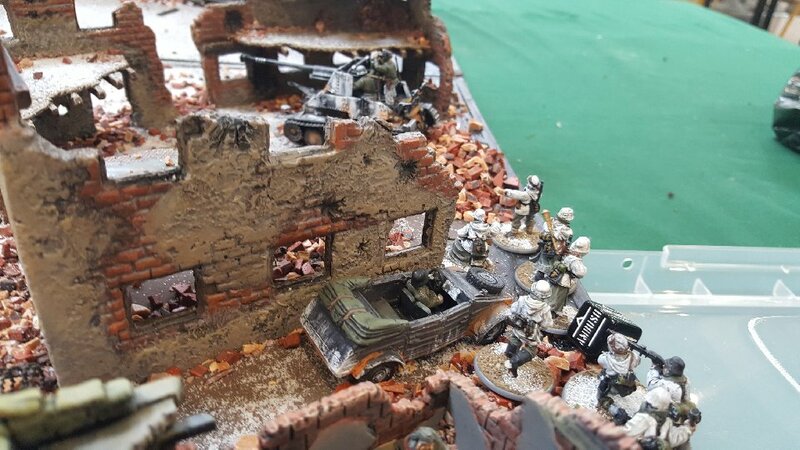 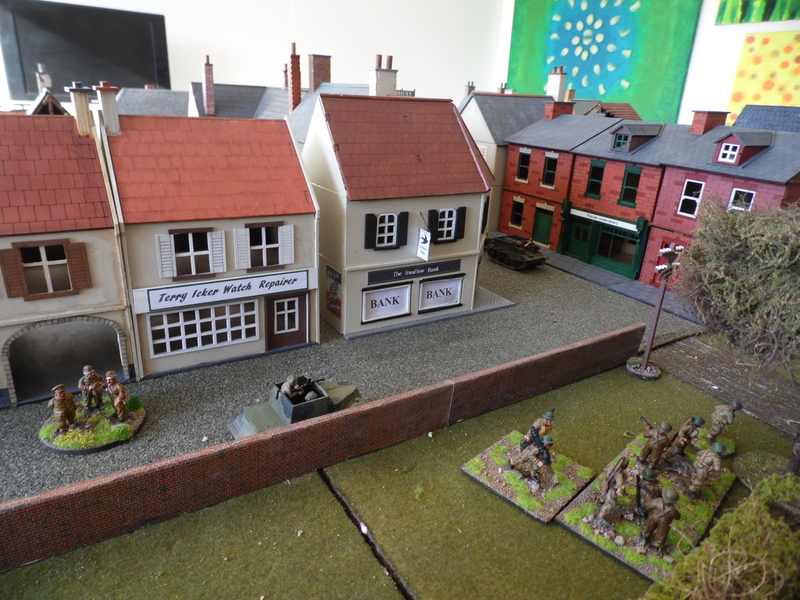 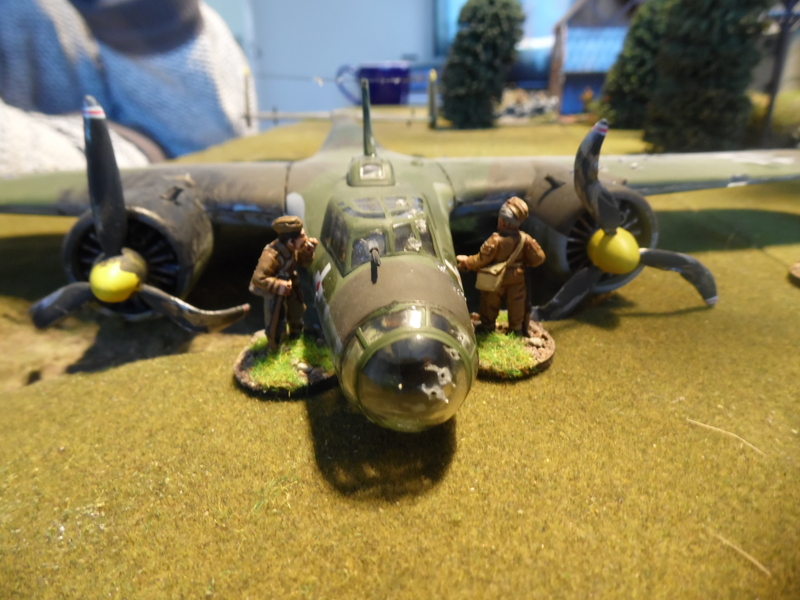 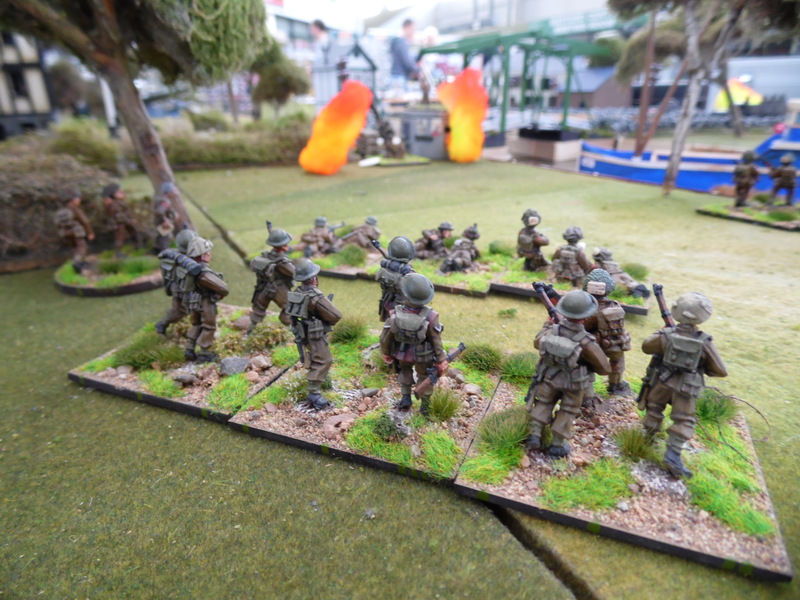 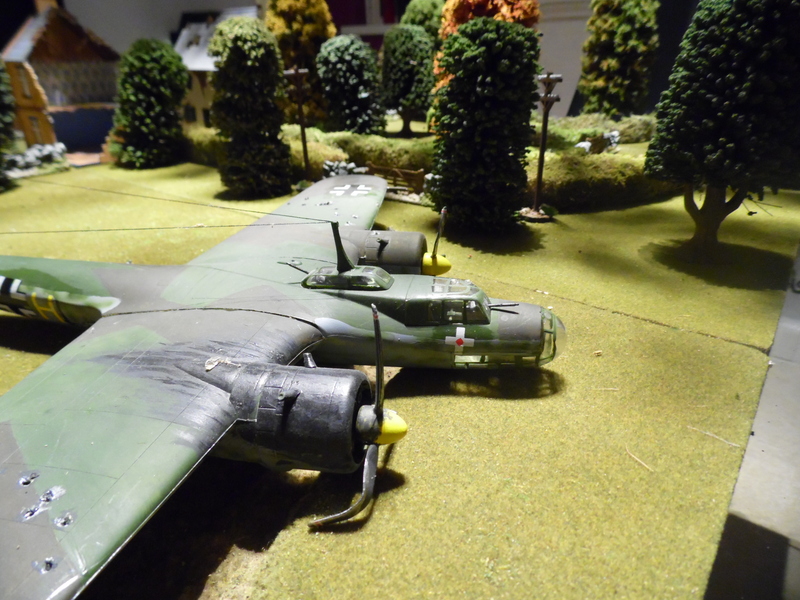 The German player decided that he had held up the advance enough and caused enough damage to satisfy his senior commander and so could start the withdraw ( It could have been the need to get home to watch the world cup rugby but I would like to think it was the first reason). 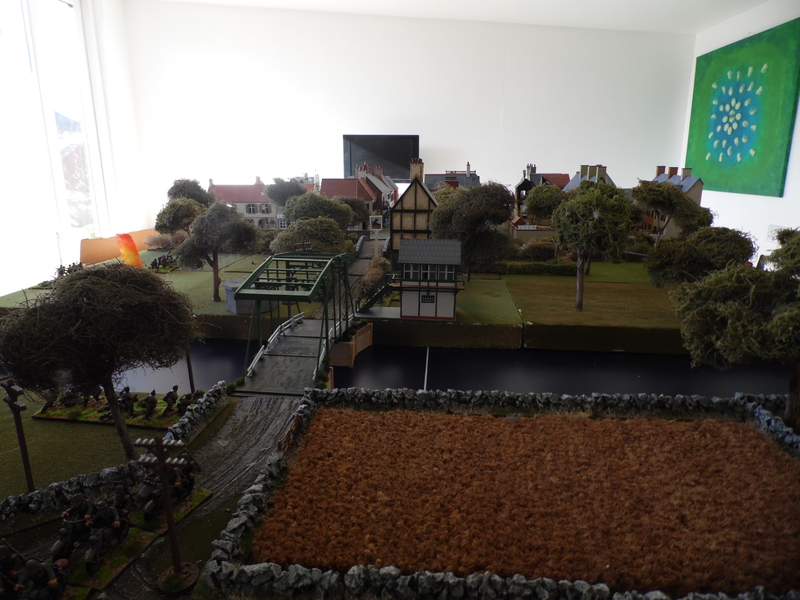 All in all a good few of hours gaming and chatting. 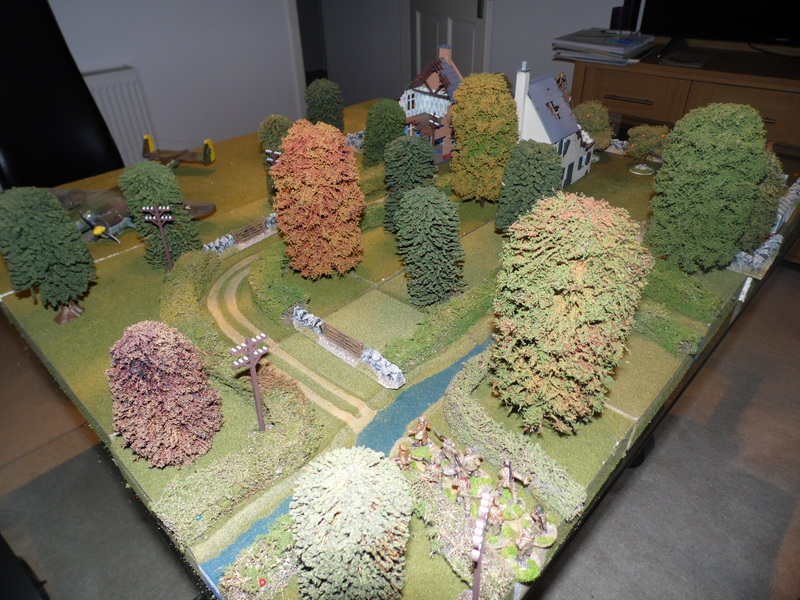 The rules will need a little work on for spotting etc but nothing too altering. 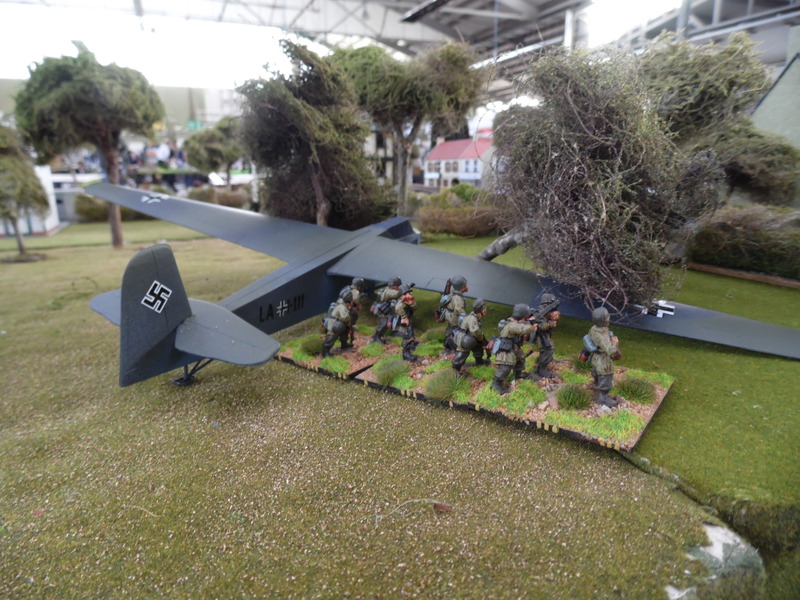 Here are a few other pics including a flyby by a reconnaissance plane! 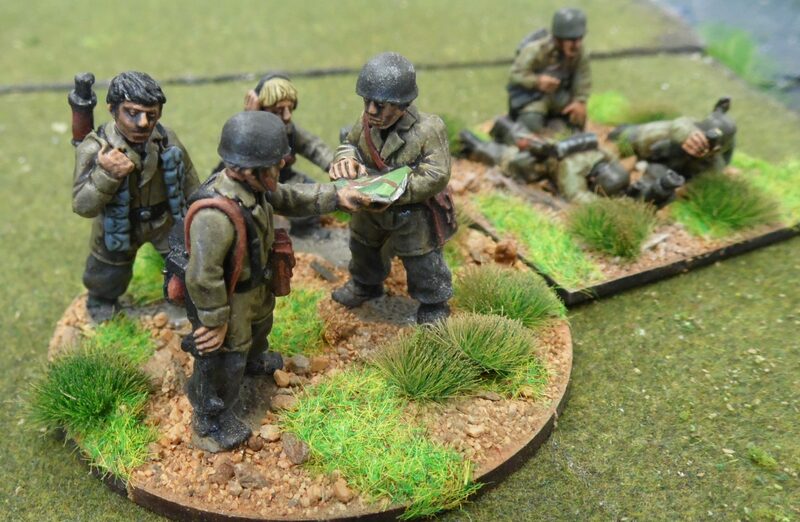 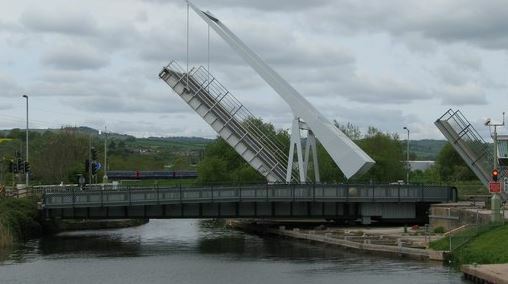 The recon picture. 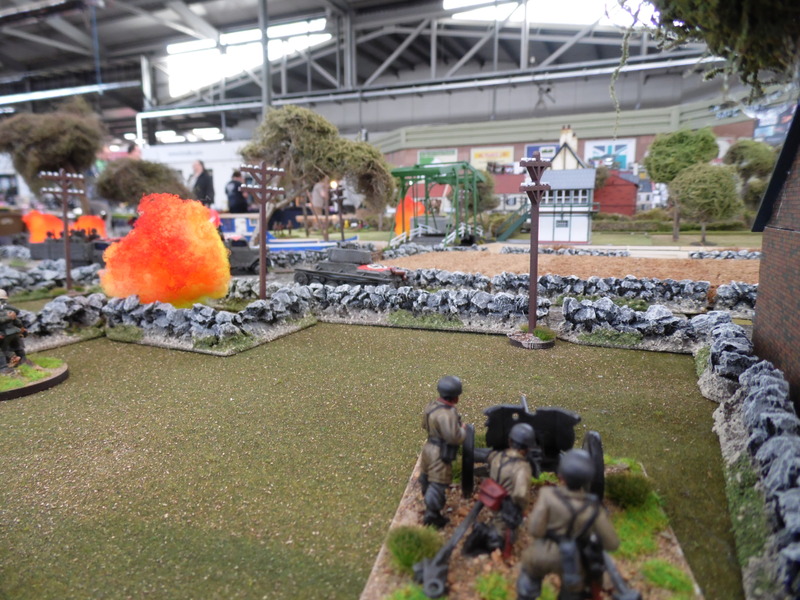 The explosions really stand out. 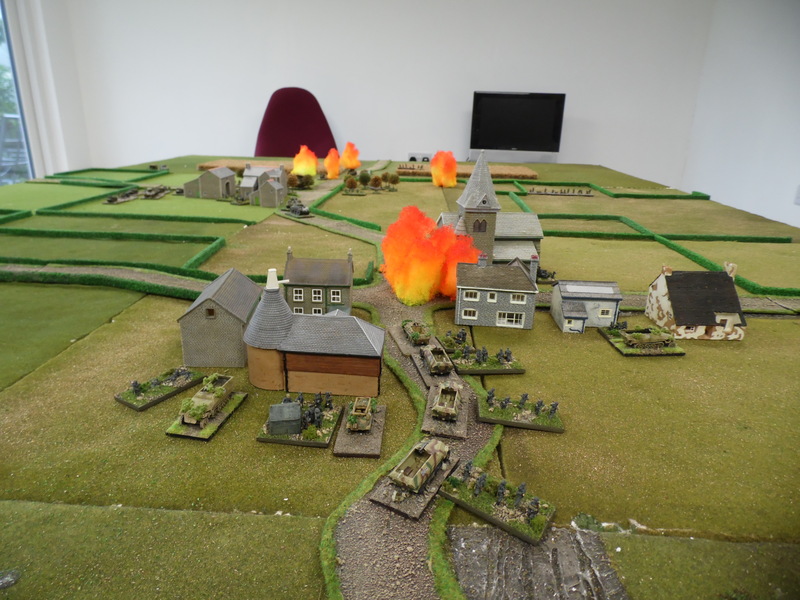 British advance past their burning wrecks. 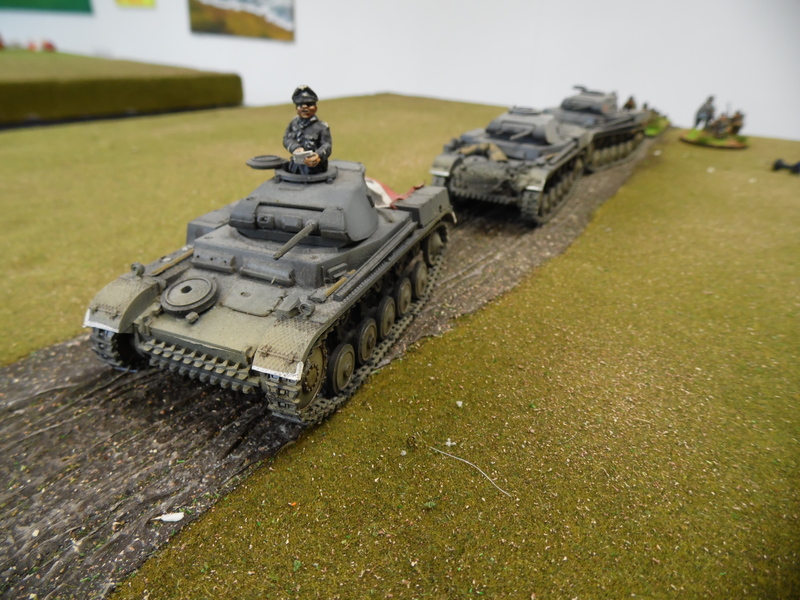 Panther reinforcements. 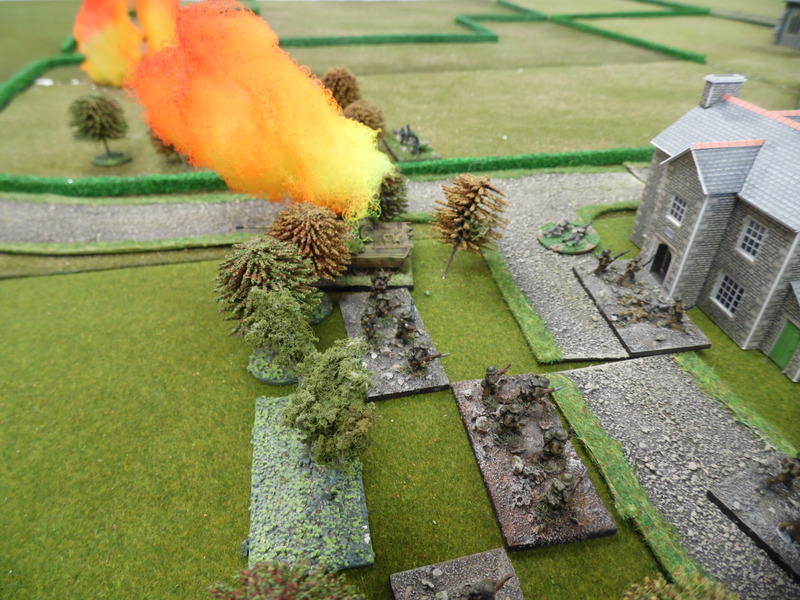 thankfully he moved just before the artillery barrage landed. 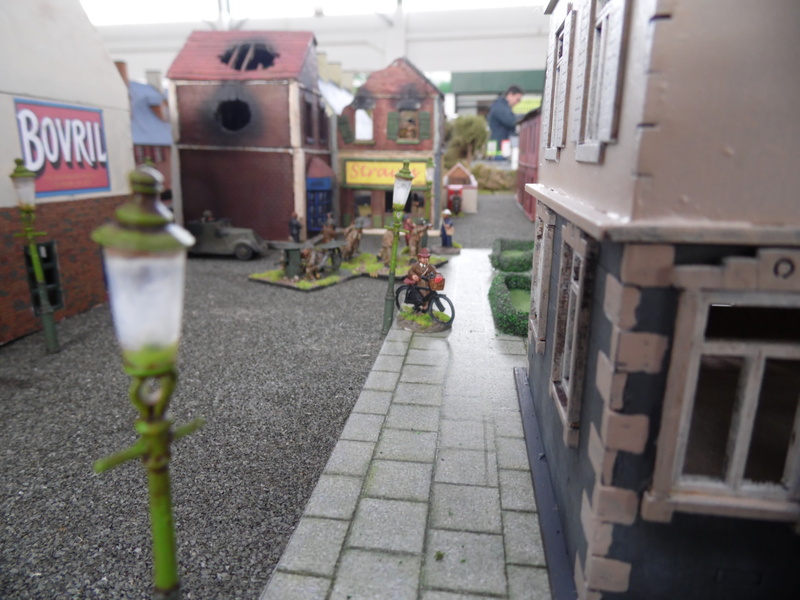 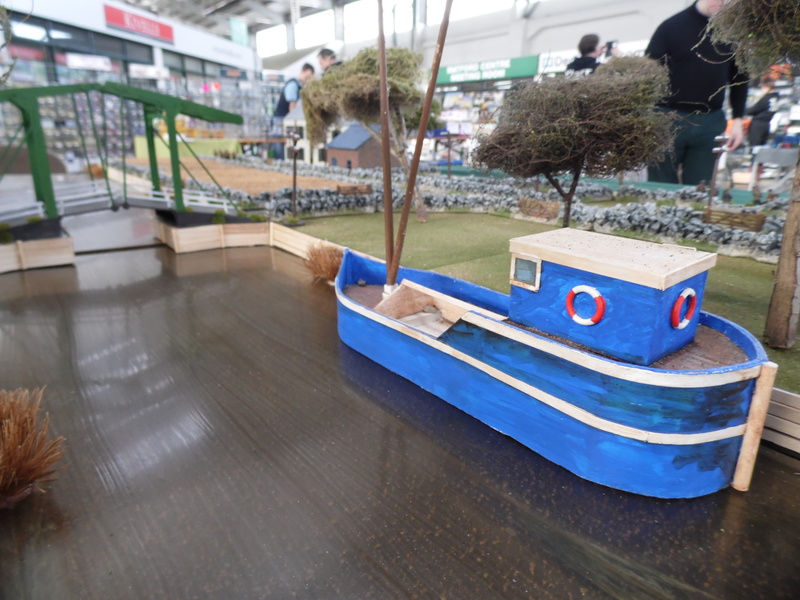 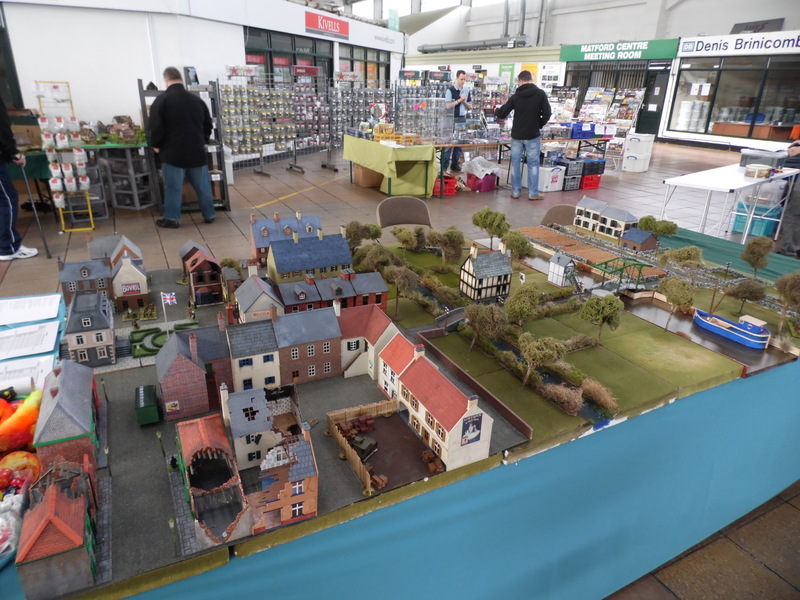 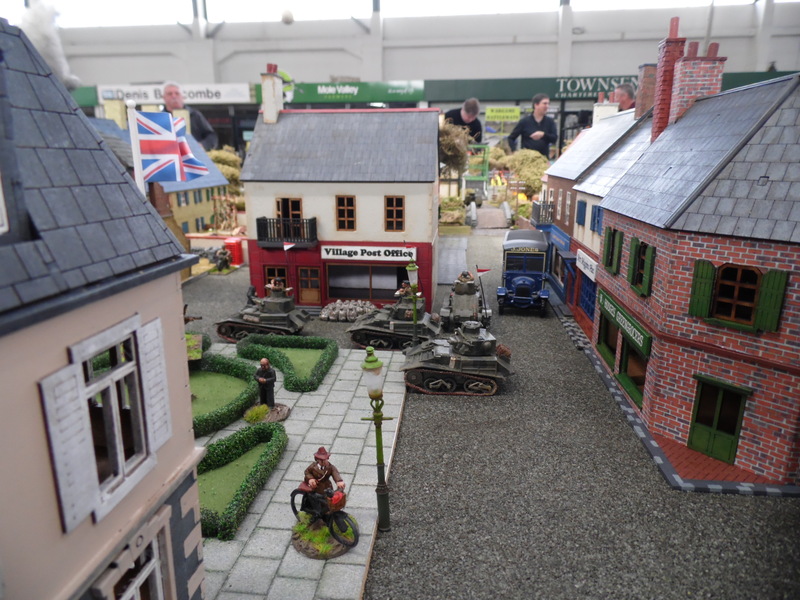 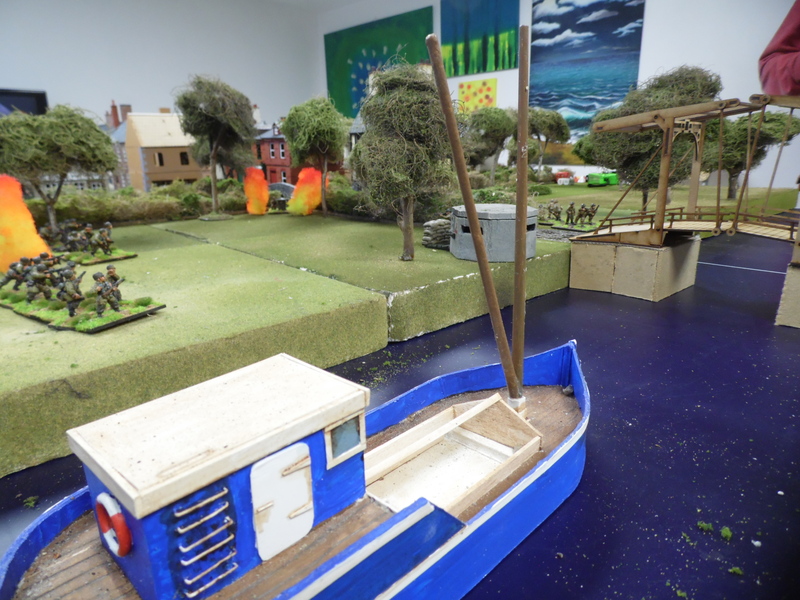 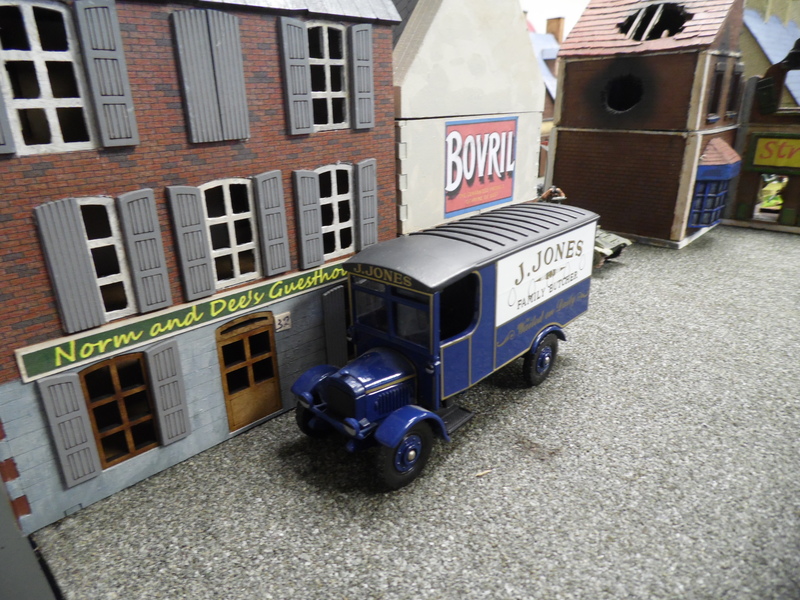 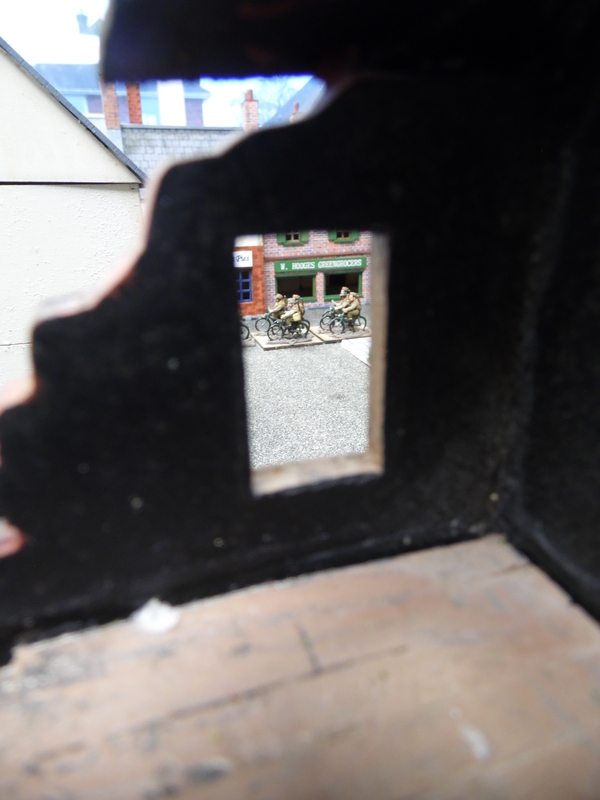 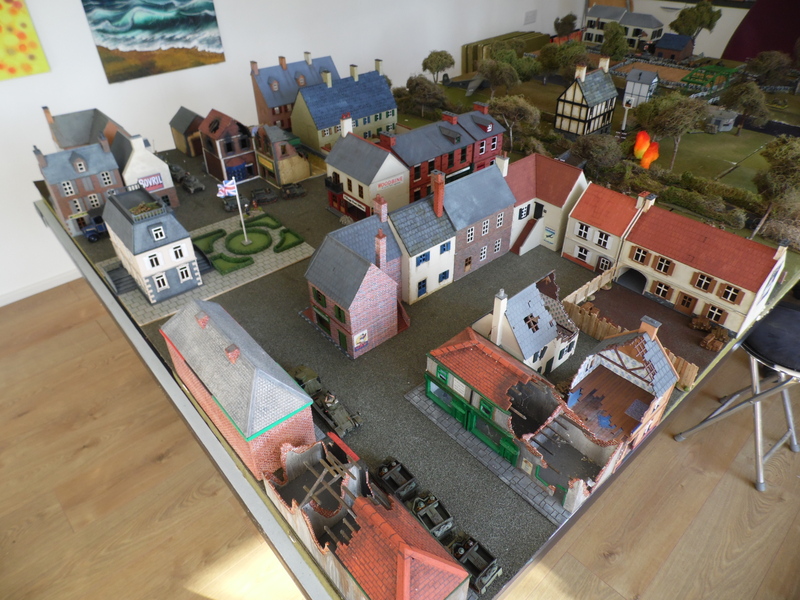 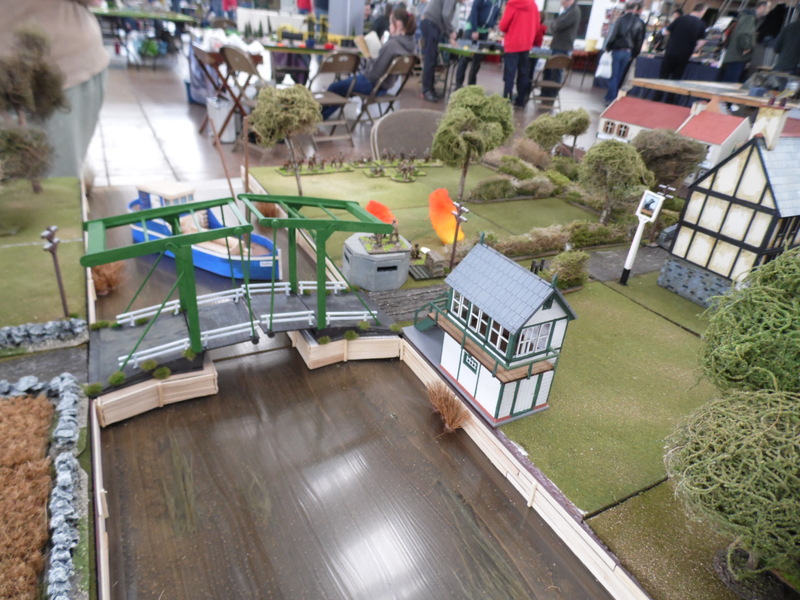 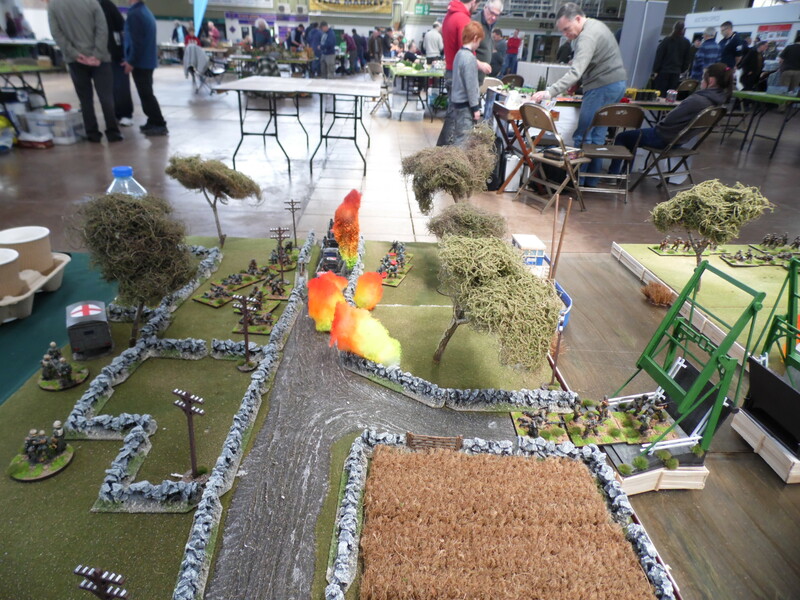 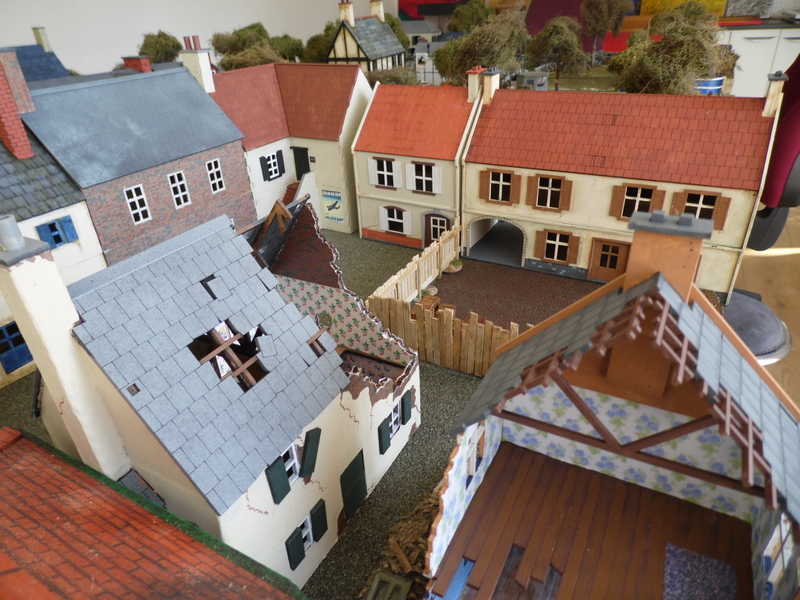 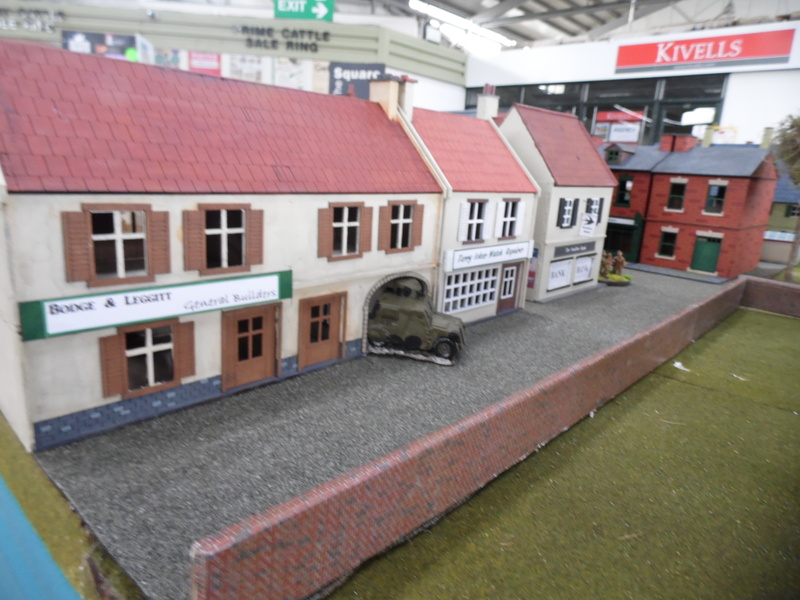 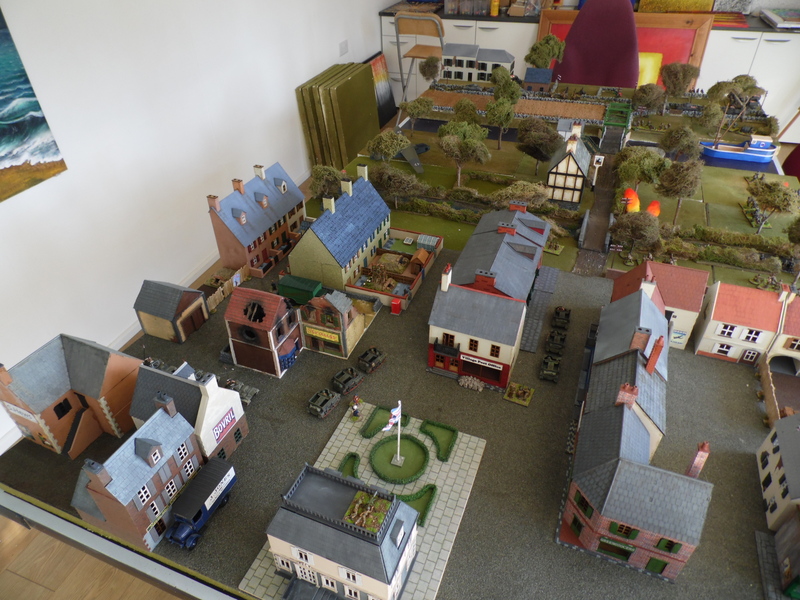 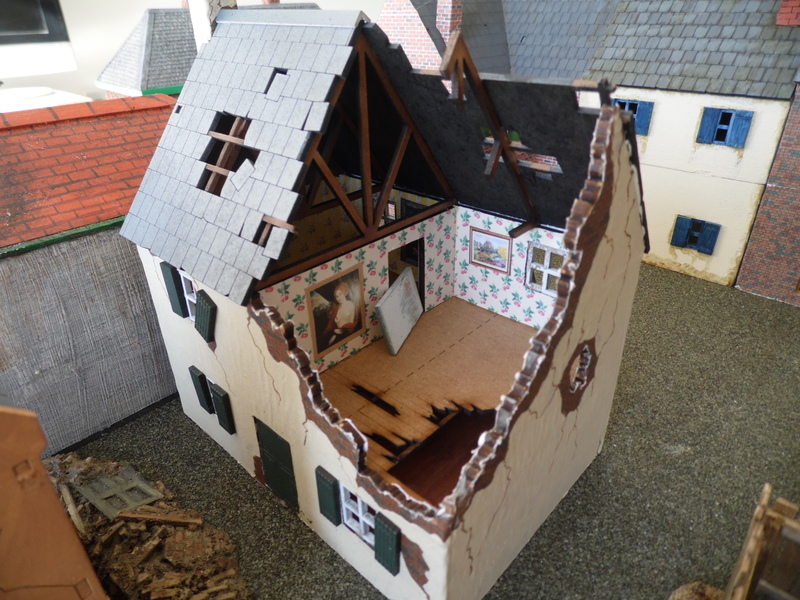 The buildings are Hornby N gauge Lyddle End range and the farm is a card kit from Metcalfe. 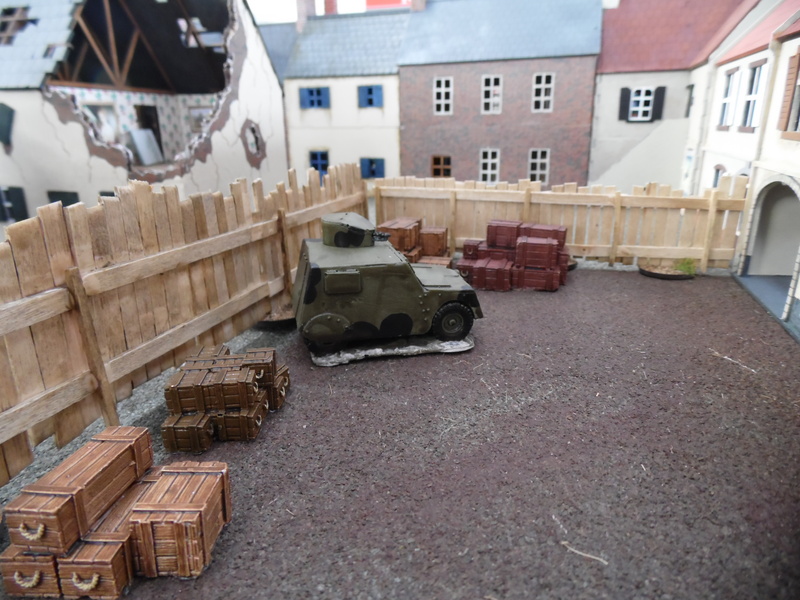 the cardboard kit is really good and great value for money. 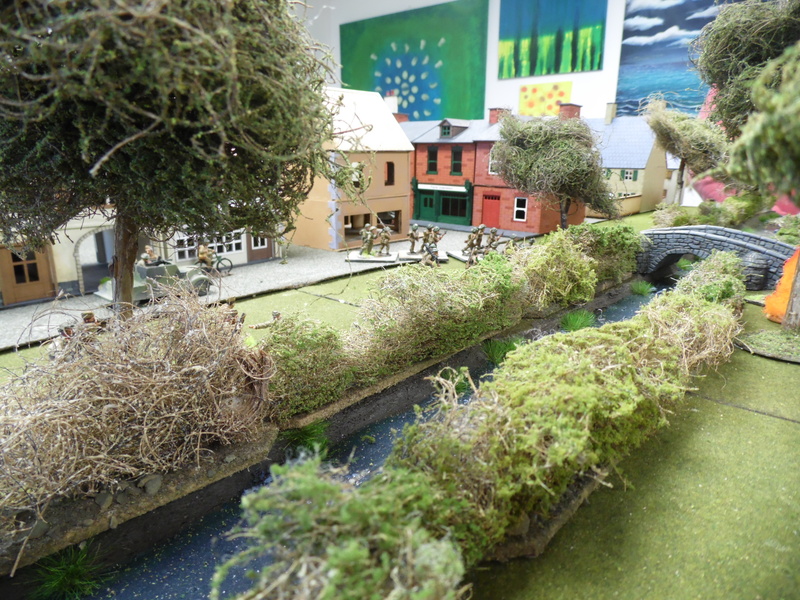 The hedges are Javis OO/HO flexible hedges, great value. 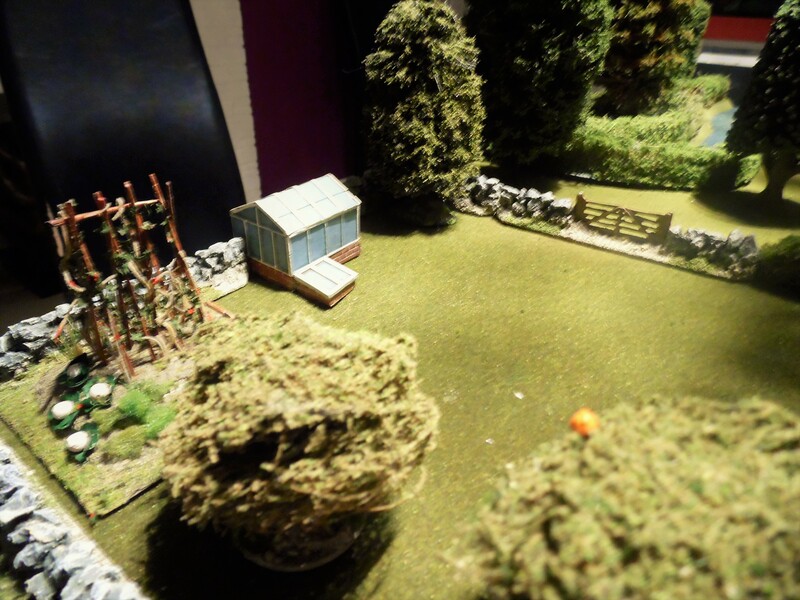 The trees are some old K&M ones, I have had for years. 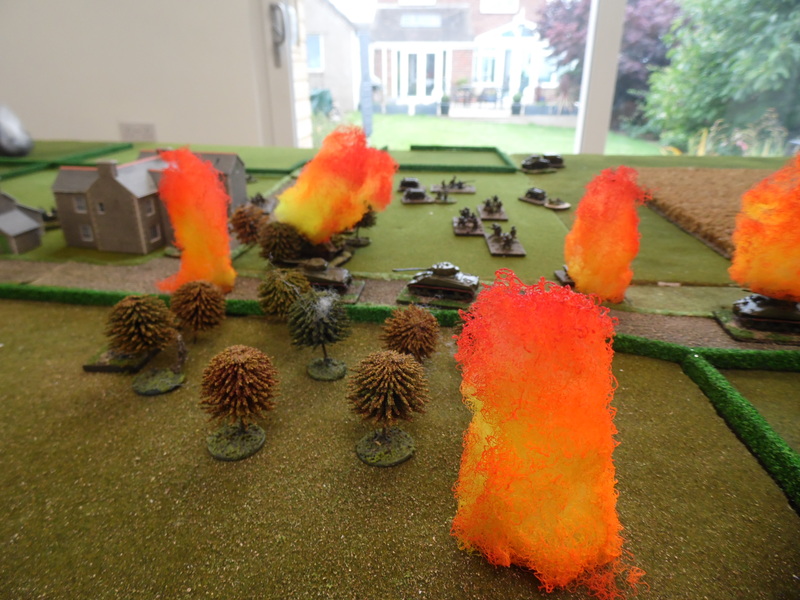 The explosions are home made – These only took 10 minutes to make. 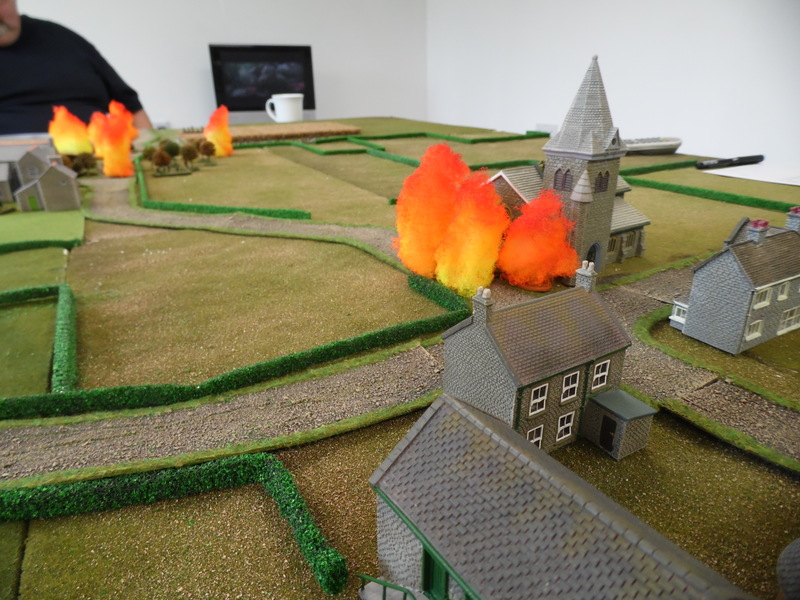 Will show you how in my next blog.